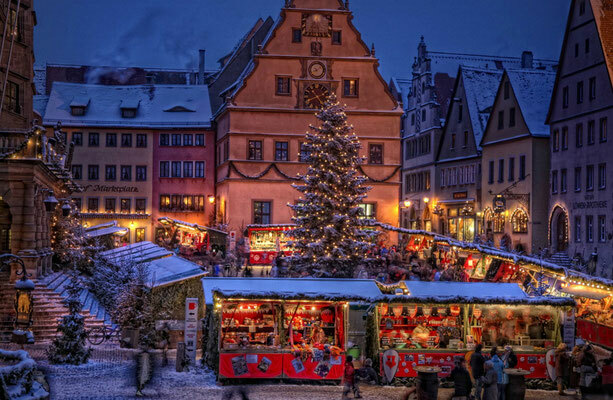 Winter in Europe is a wonderful time to visit the most beautiful Christmas markets. 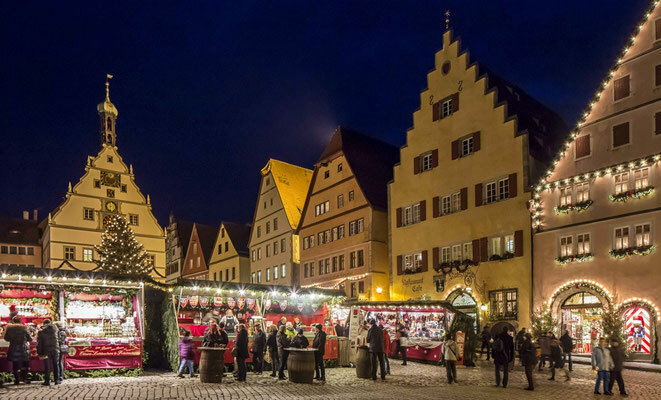 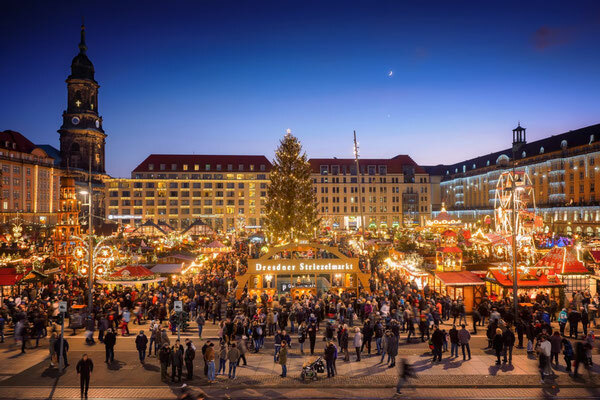 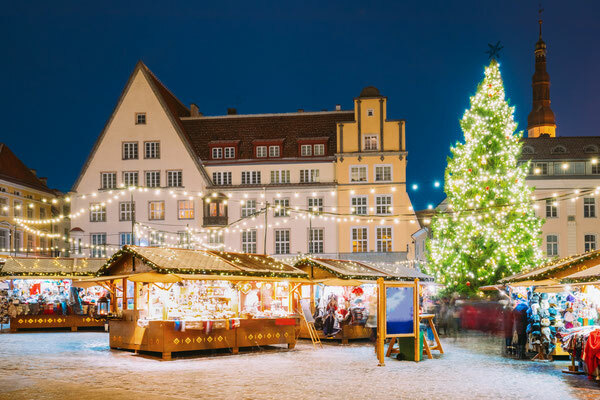 If you are looking for Christmas presents and dream of the lovely smell of a Christmas tree or the lovely sound of Christmas carols, please dive into our selection of the best Christmas markets in Europe, the best destinations for perfect Christmas holidays. 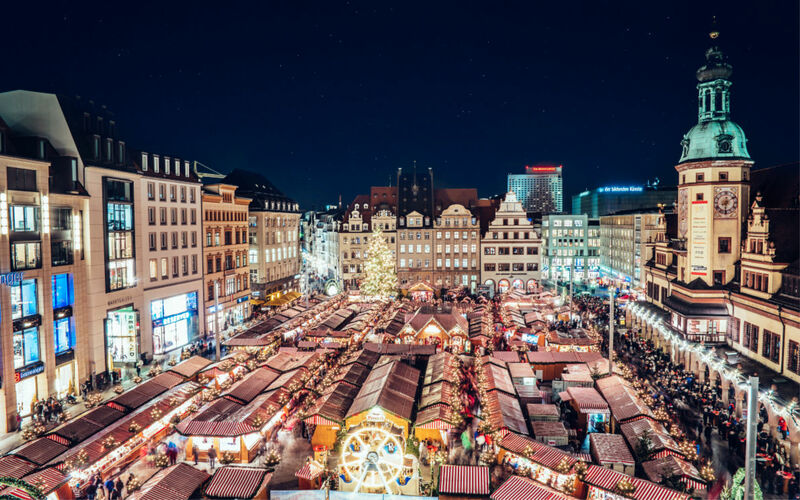 Every year you are millions of travellers to view this ranking and hundreds of thousands to vote for your favourite Christmas markets in Europe. Congratulations to the 20 destinations selected by travellers for the quality and reputation of their Christmas markets! Discover the list of the best ones in Europe and our page dedicated to the Most beautiful Christmas markets in Europe as well as the best Christmas markets in France, Germany and the UK. Treat yourself to a 3 or 4 days long weekend and discover the best Christmas City Breaks and the most beautiful Christmas trees in Europe. 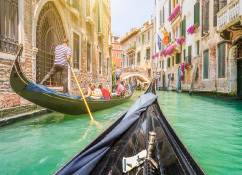 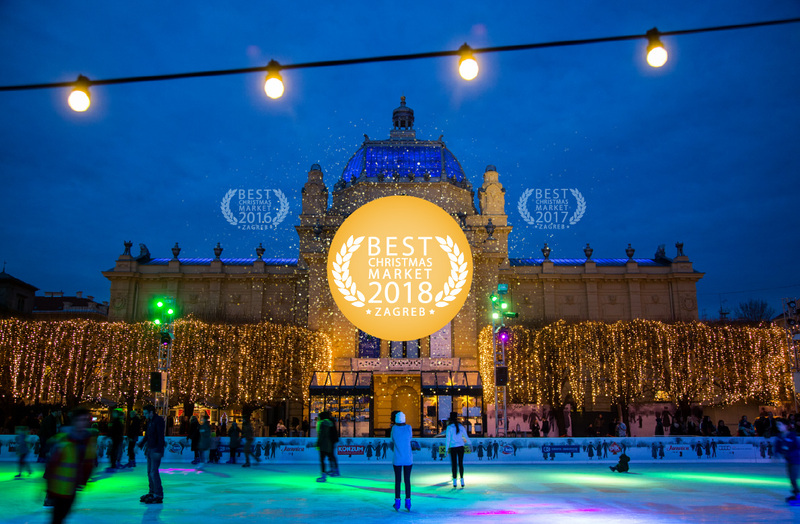 We have dozens of thematic rankings such as the best ski resorts or the most romantic destinations to help you find inspiration for your next holiday! 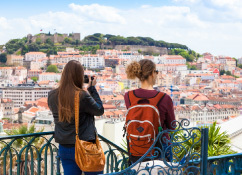 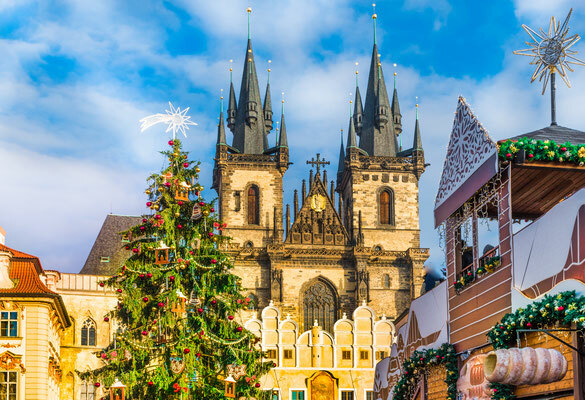 Book your hotel, guesthouse, B&B, apartment at the best price guaranteed in Europe as well as your best activities and discover the most beautiful Christmas markets. 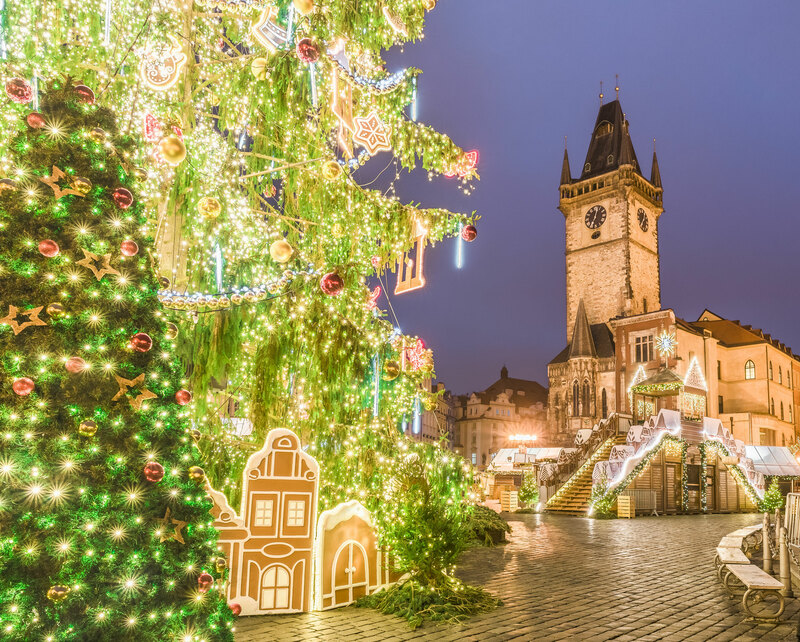 The sound of Christmas bells, the scent of gingerbread, mulled wine and various other delicacies... Just forget everything and enjoy all these wonderful things! 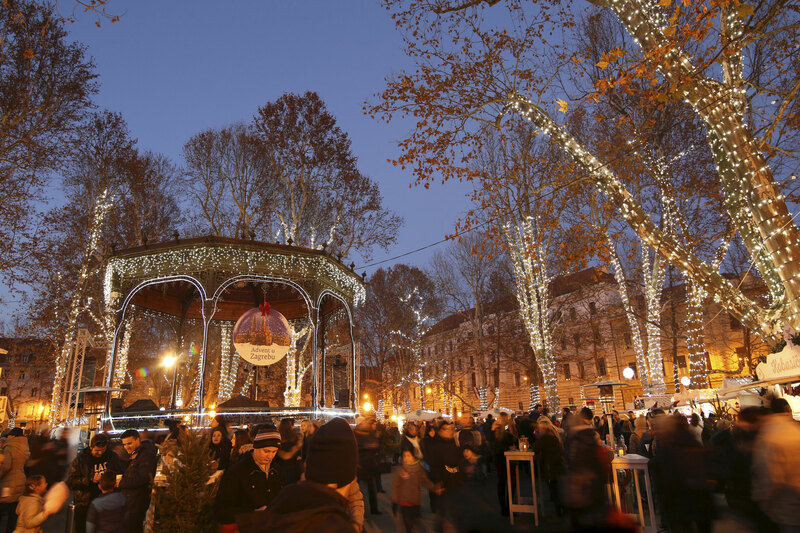 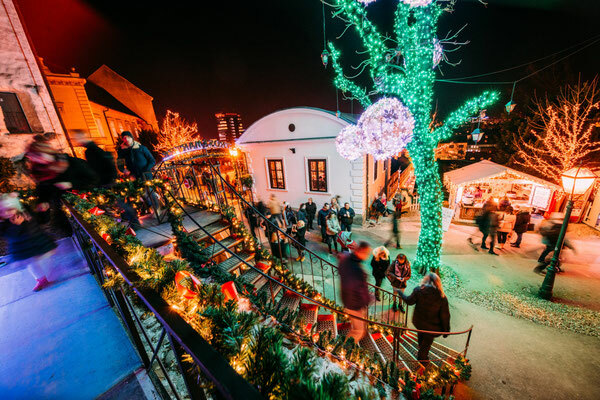 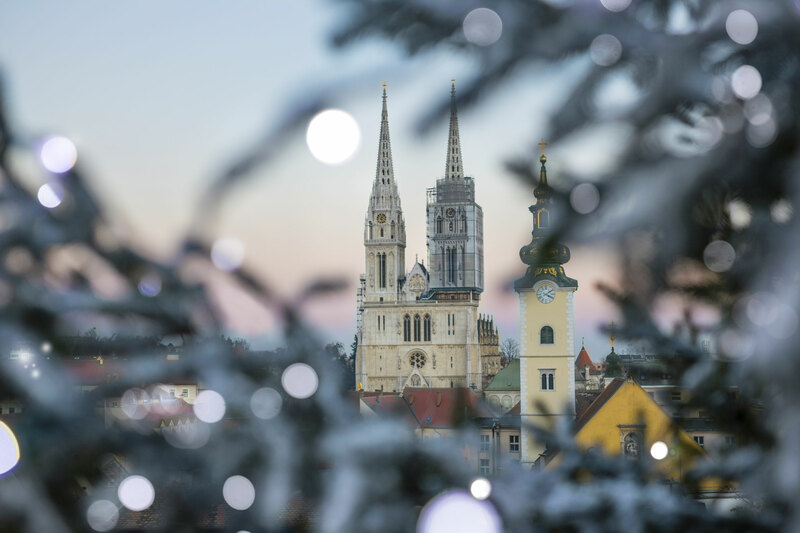 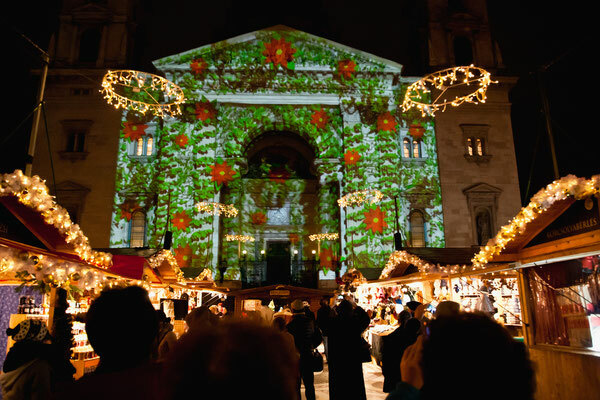 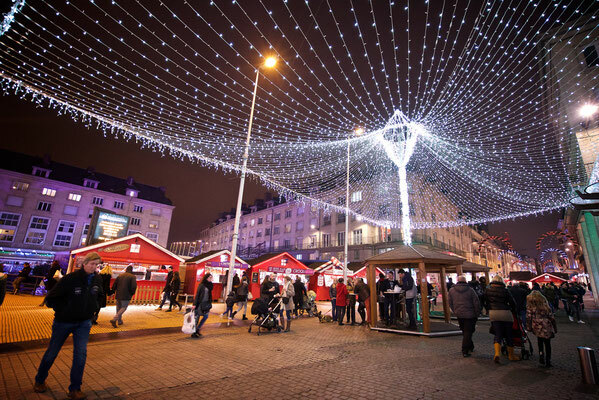 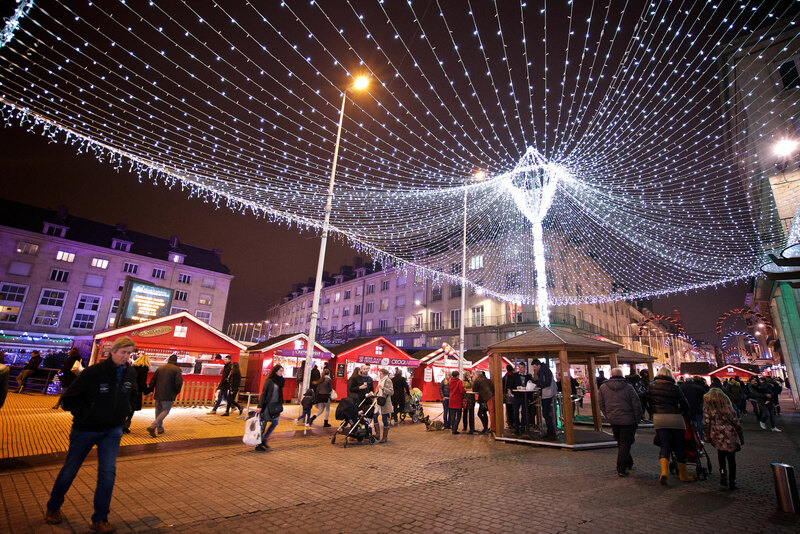 During the Advent season, Zagreb offers a variety of events that will satisfy even the most demanding visitors. 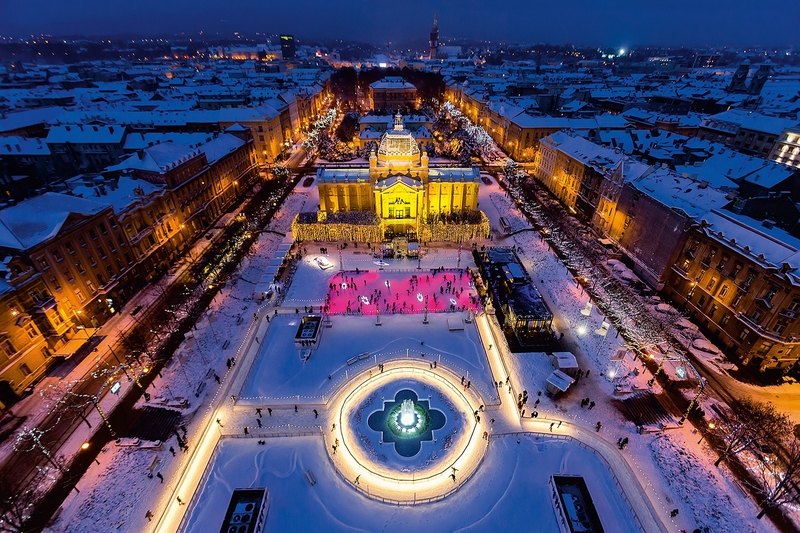 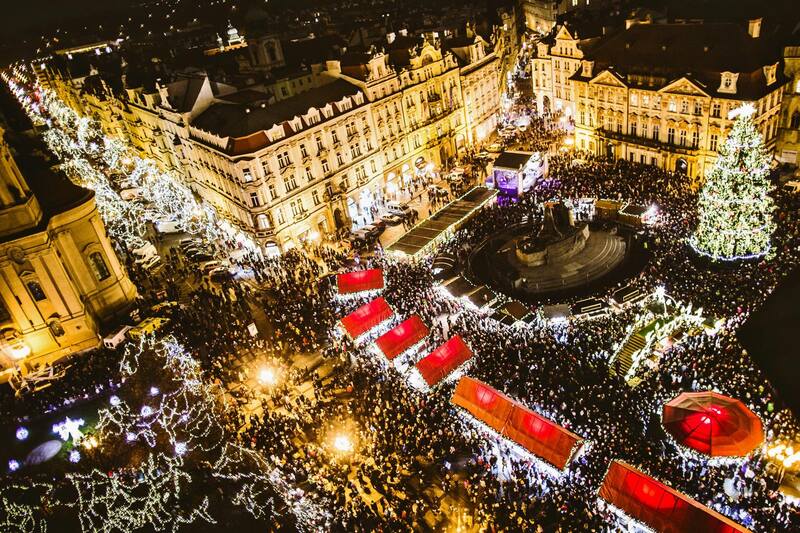 Plenty of fun, excellent food, unique events, art, but also a genuine Christmas atmosphere, await you on the streets of Croatia's capital. 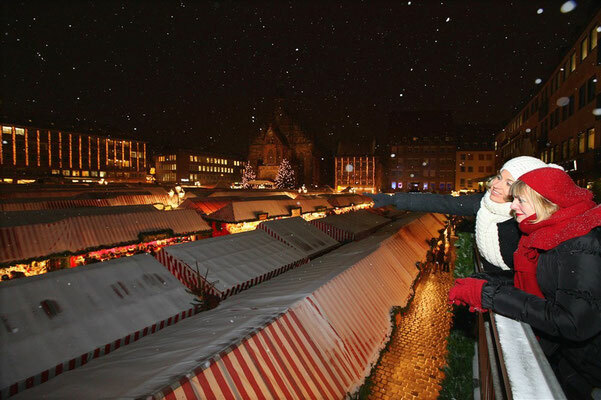 Don't wait for Santa sitting by your fireplace, find him in the city! 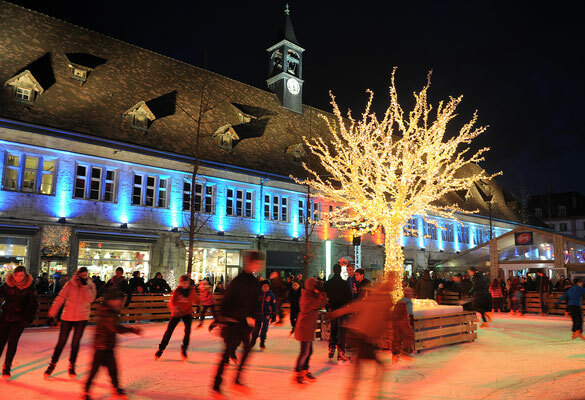 Make sure you polish your boots before you go because we have in store for you a number of pleasant surprises, including the musical program which will make you want to dance all night long! Book your flights, your best activities in Zagreb as well as your accommodation at the best price in the Capital of Croatia which is also your European capital of Christmas! 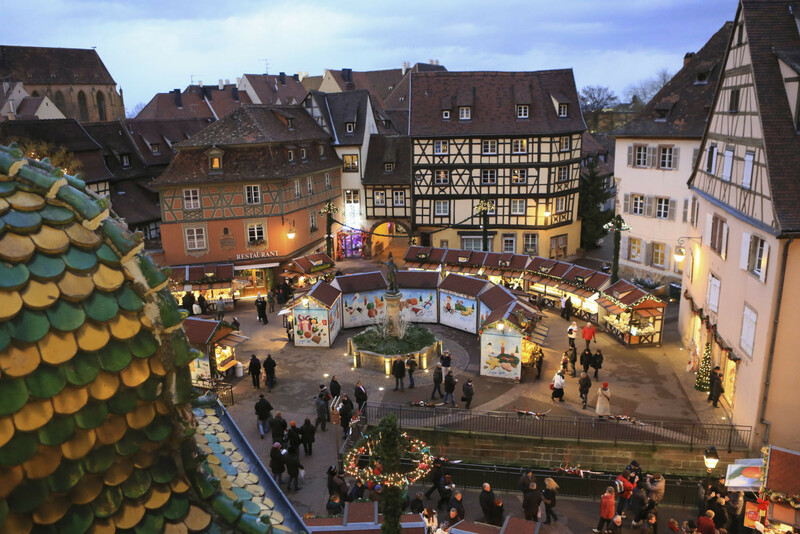 You elected Colmar as the 2nd best Christmas Markets in Europe and the best Christmas market in France! 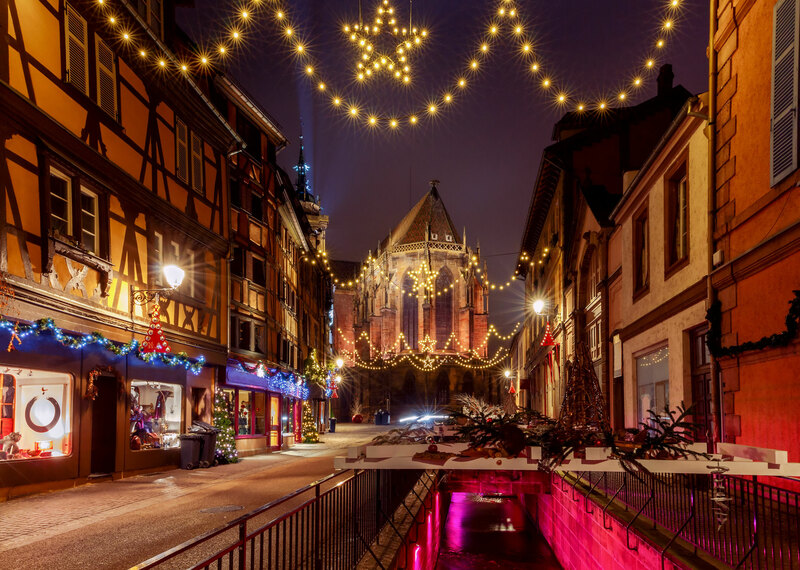 Colmar combines all the ingredients of a dream destination: culture, relaxation, well-being, gastronomy, wines, traditions, architecture. 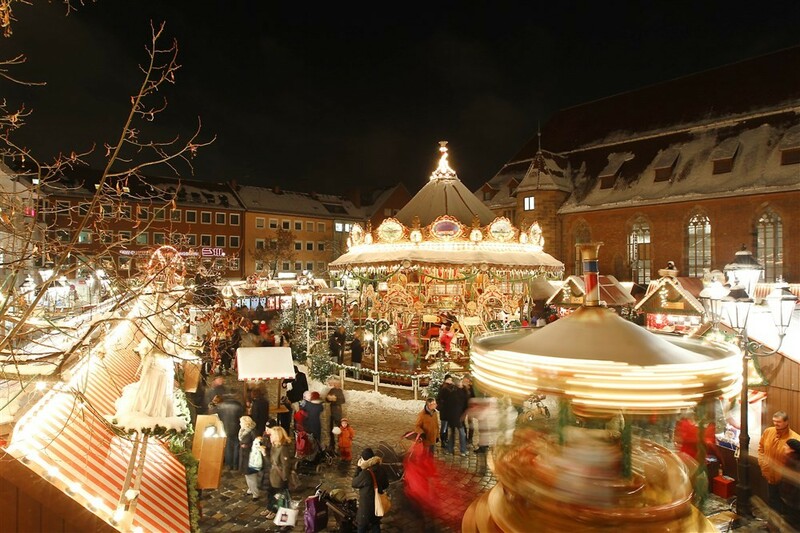 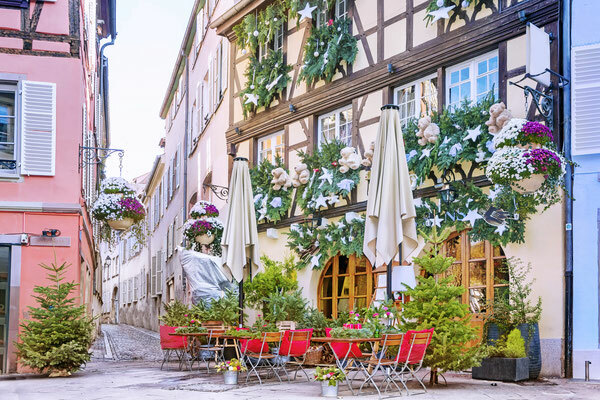 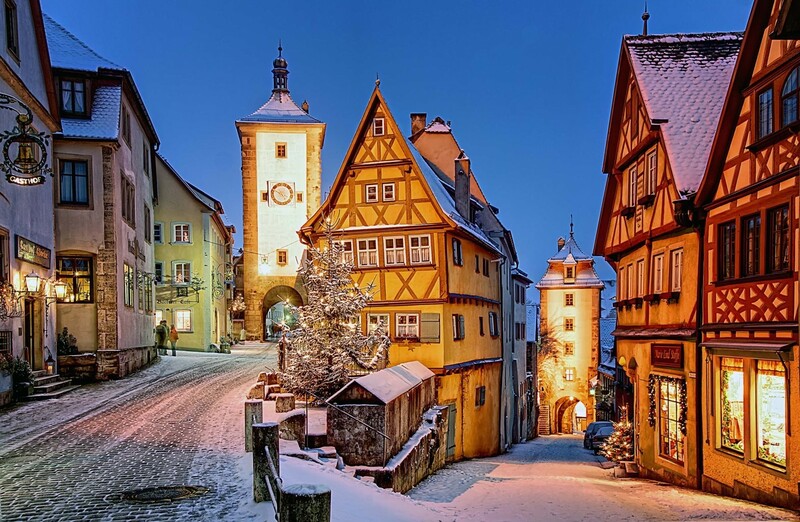 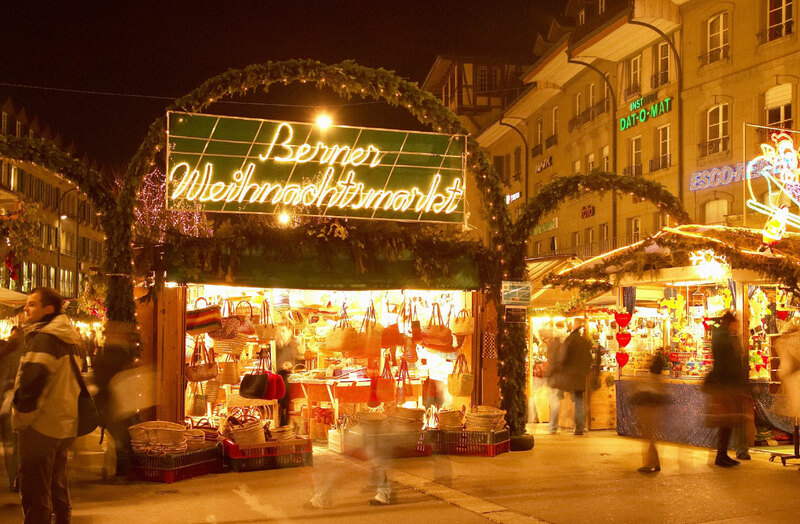 Its Christmas market is world famous and Colmar is a friendly and safe destination. 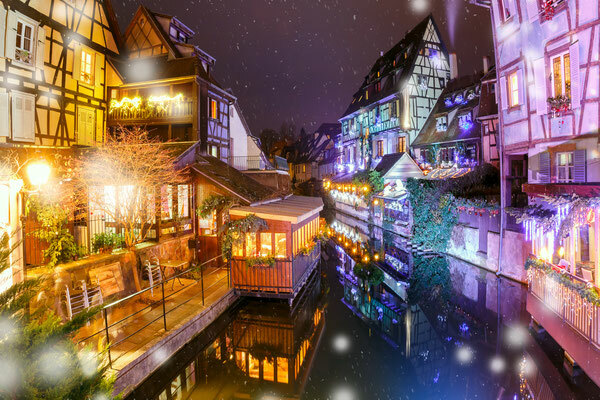 Let’s go to Colmar, a city where the magic of Christmas has been experienced in its purest form for six entire weeks, since 19 years. 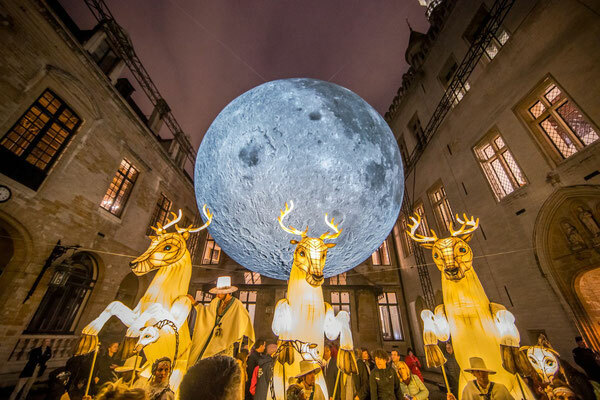 Your way will be drawn by illuminations linking to the city’s five Christmas markets, in a labyrinth of small streets lined with century old half-timbered houses. 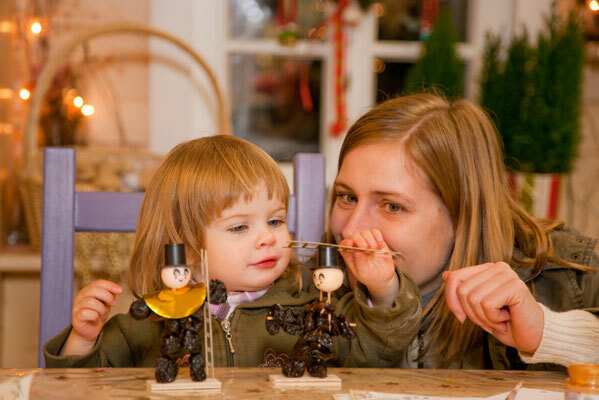 It is perfect for families, lovers, friends. Book your hotel, B&B, apartment at the best price guaranteed in Colmar. 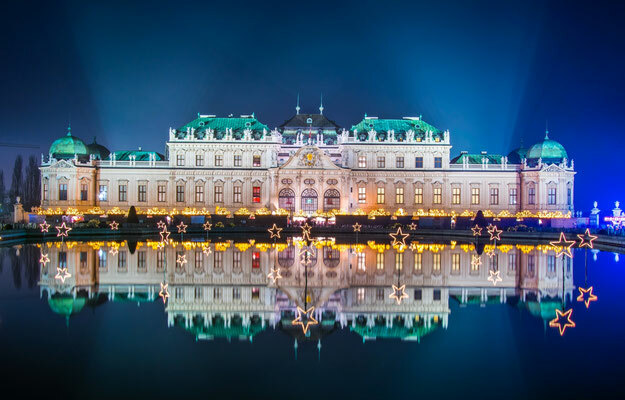 Vienna is for most travellers one of the best destinations in the world to celebrate Christmas. 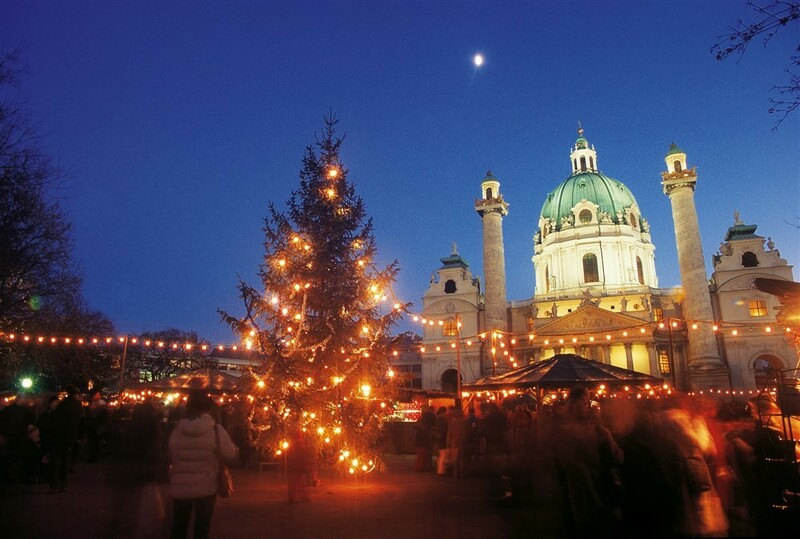 That is why you voted for Vienna as one of the three best Christmas markets in Europe. The whole city turns into a gigantic, magical and unique Christmas market. 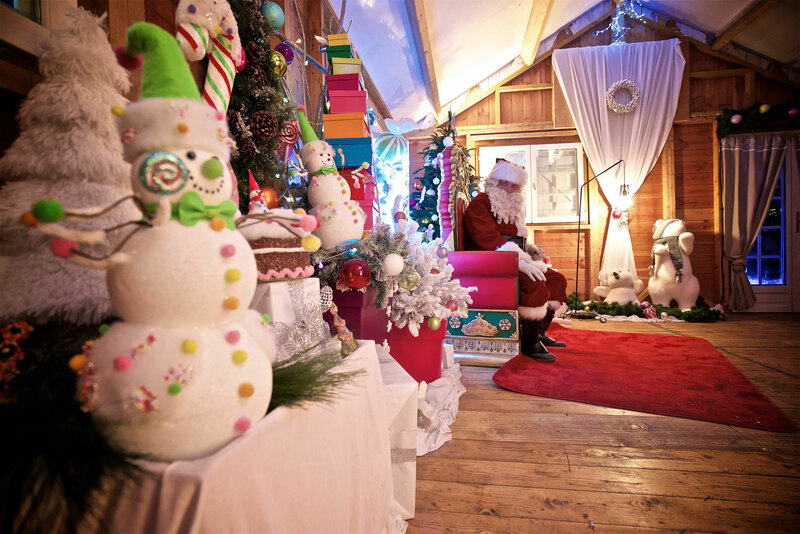 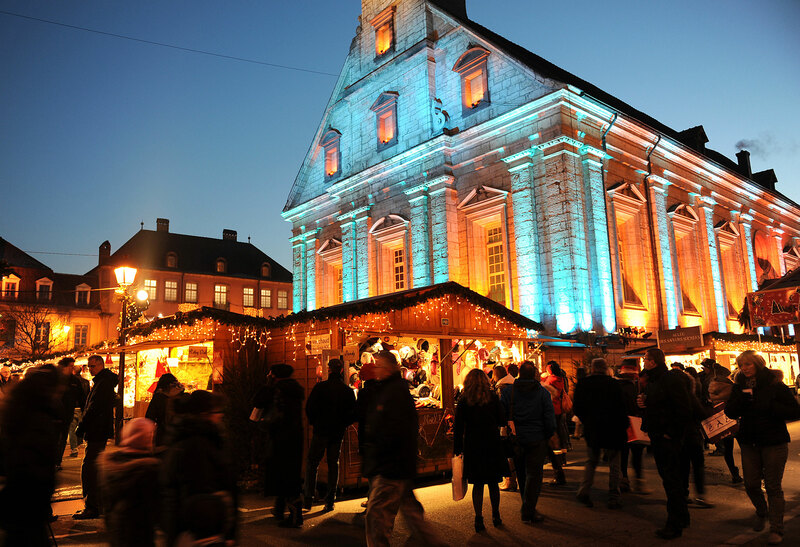 This Christmas Market will leave you with unforgettable memories and is perfect for both young and old. 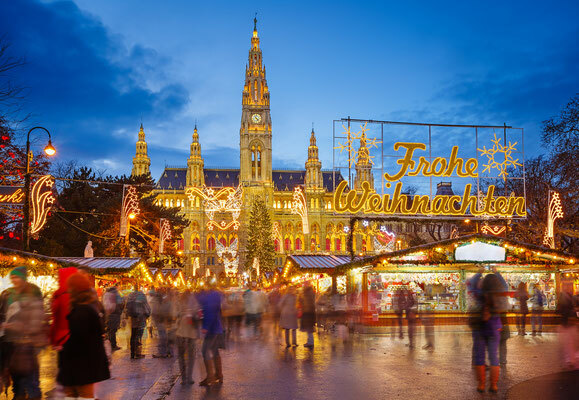 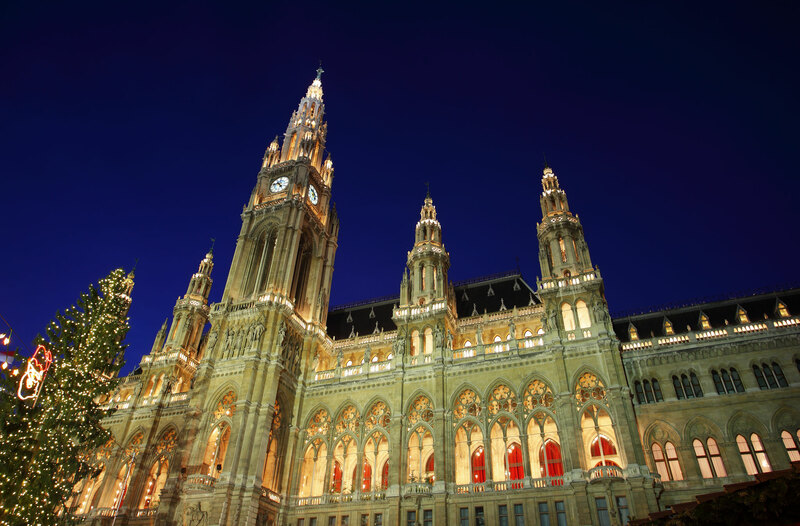 Ranked among the safest destinations in Europe for its low crime rate, Vienna is the perfect destination for a great time with friends, family or lovers. Check out all the hotels, B&Bs, apartments available in Vienna at the best price guaranteed and book your flights as well as your best activities in the Austrian capital. 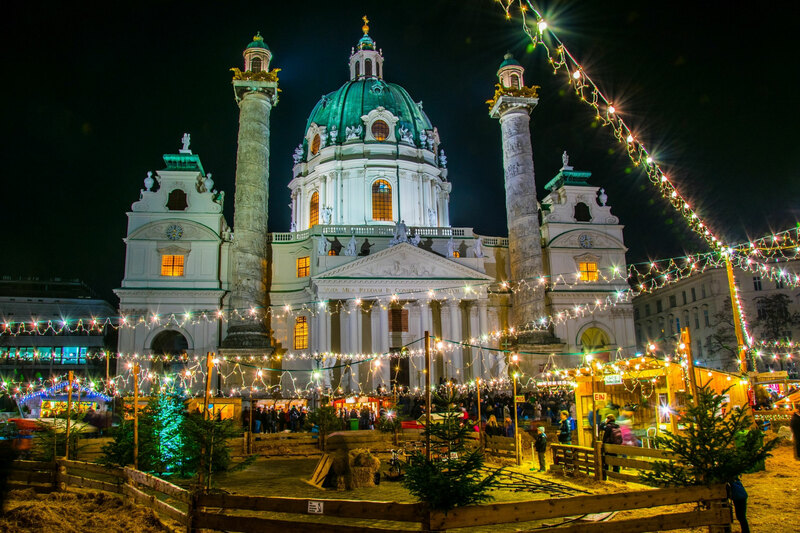 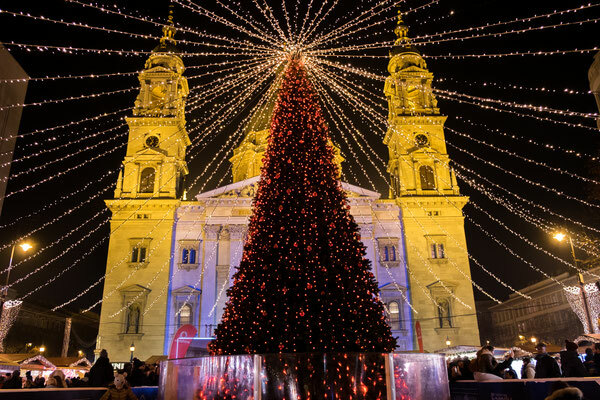 Advent Feast at the Basilica in Budapest is your favourite Christmas market in Hungary but also one of your 5 favourite Christmas markets in Europe. 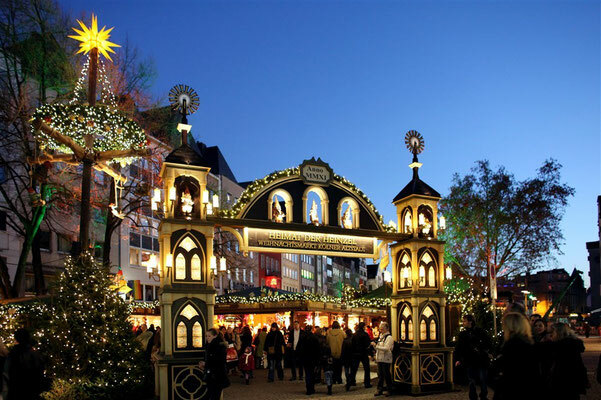 The organizers of this event work hard every year to offer you what is certainly one of the most beautiful Christmas markets in the world. Do you know that Santa Claus himself goes shopping to the Advent Feast at the Basilica? 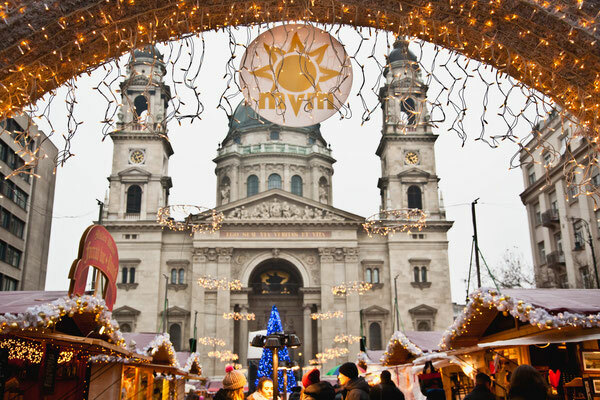 Discover this enchanting city-centre Christmas celebration rich within Central European holiday traditions; it also features modern elements such as flash mobs, a wide range of the best Hungarian contemporary hand-craft products, and the monumental light show that with 3D glasses will give a new dimension to the façade of St. Stephen’s Basilica. 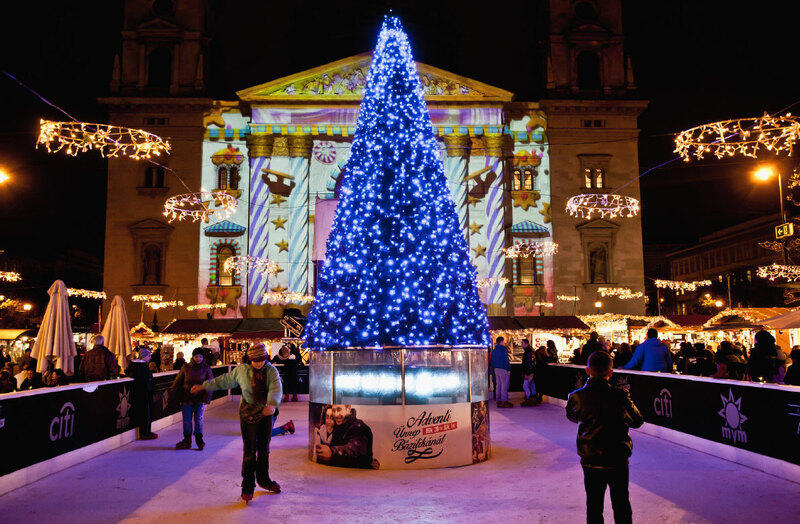 Discover this amazing Christmas market and book your stay at the best price guaranteed in Budapest as well as your best activities. 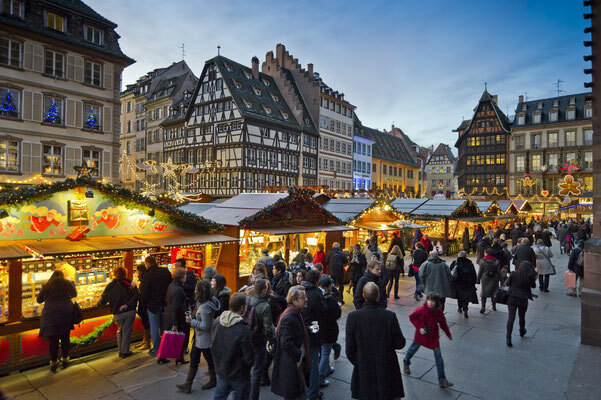 Several times voted as your favourite Christmas market in Europe, Strasbourg remains a must for Christmas lovers. 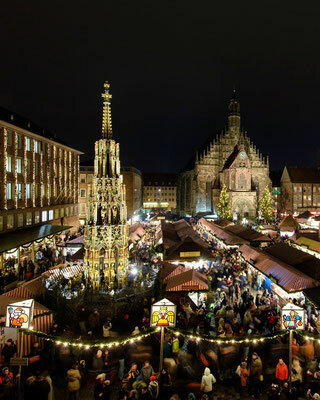 The one that bears the name of "Capital of Christmas" has not finished marveling you with sublime illuminations, a traditional Christmas market with all the Alsatian specialties , its unique atmosphere and its beautiful hotels for a city break in the heart of one of the most beautiful cities in Europe. 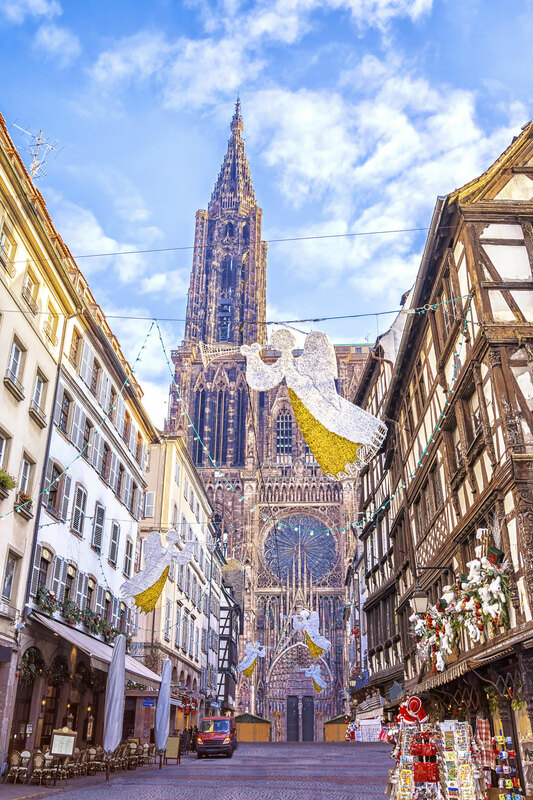 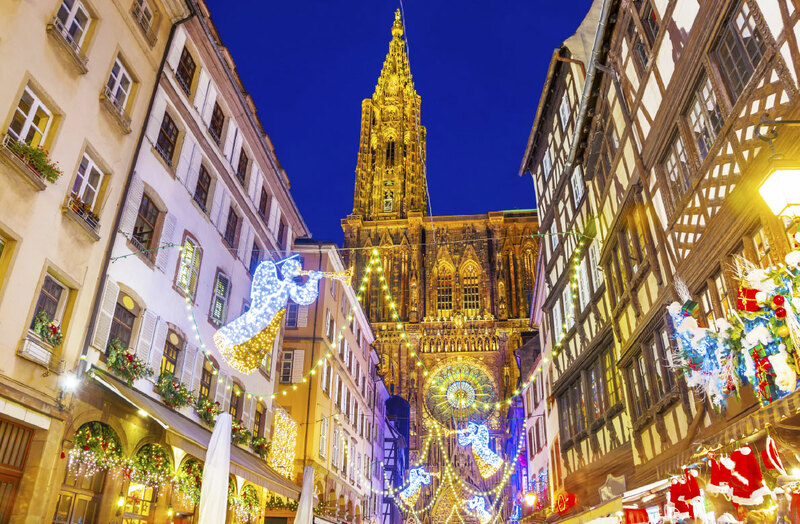 The spiritual environment and traditions of Advent are well established in Strasbourg. You will find 4 outstanding Advent concerts, a Living Nativity and a wide range of authentic live music and cultural events. 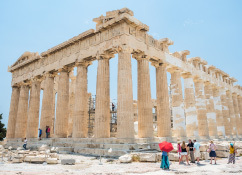 It’s the perfect opportunity to go on a cultural trip through time! 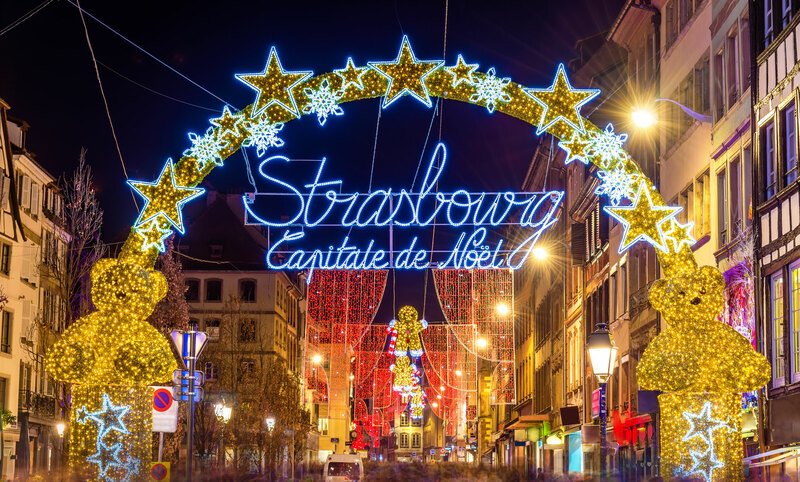 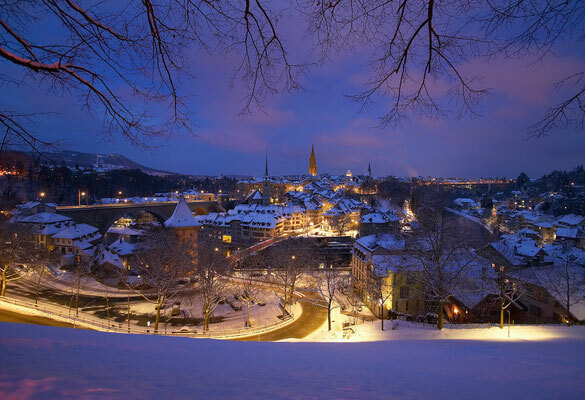 Discover the magic of Christmas in Strasbourg and book your stay in the Christmas Capital. This is the first time that a new destination in competition is so well ranked by travellers from around the world. 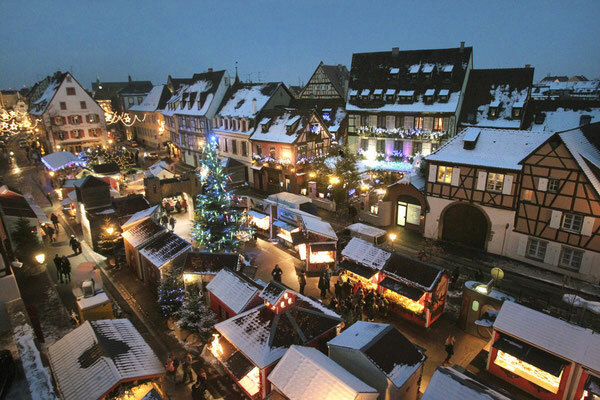 Montbeliard already ranks among the best Christmas markets in Europe and is on the podium of your favourite Christmas Markets in France. 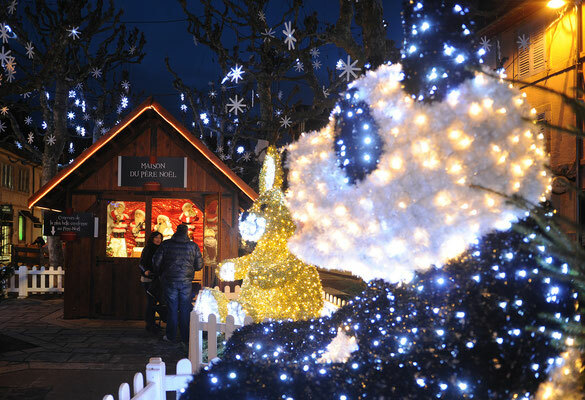 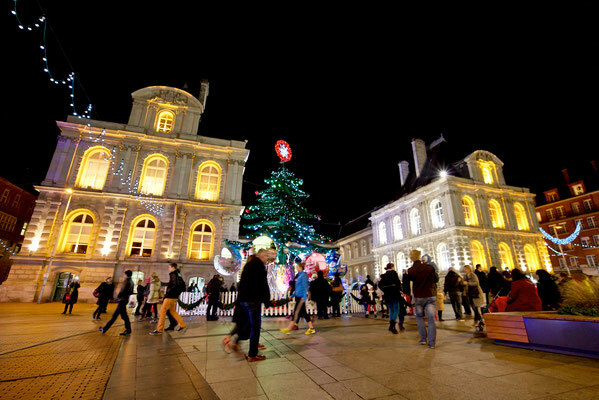 You have many reasons to go to Montbeliard throughout the year but Christmas is definetely one of the best moment! No matter how old you are, you'll enjoy beautiful illuminations, the beauty of the Christmas market, toys and pieces of craftsmanship. Do not hesitate a second and book your stay in Montbeliard at the best price. 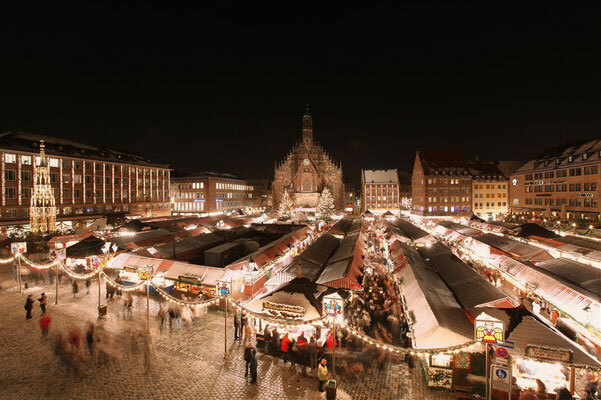 It has been your favourite Christmas market in Germany for many years. 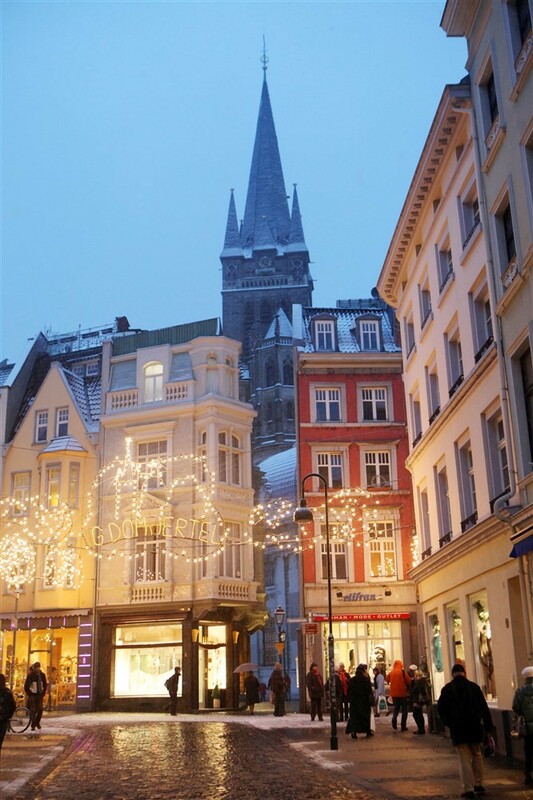 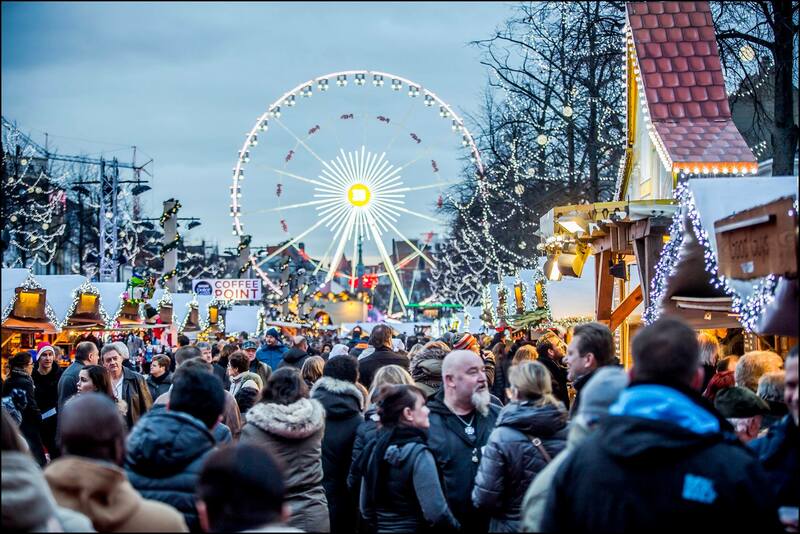 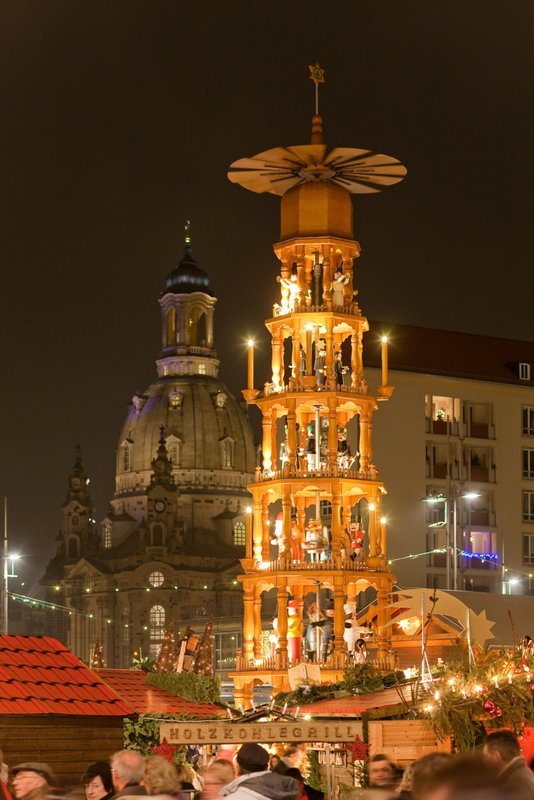 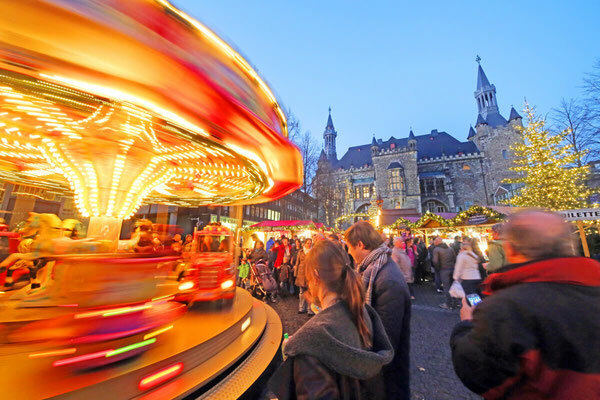 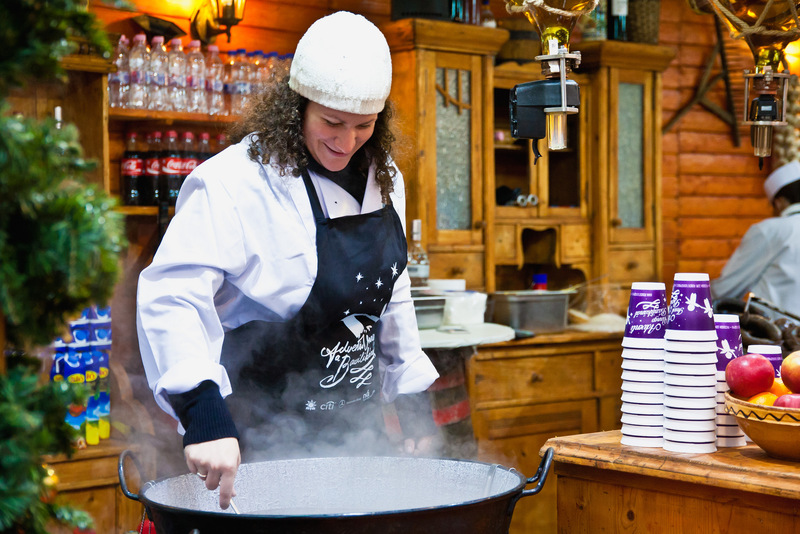 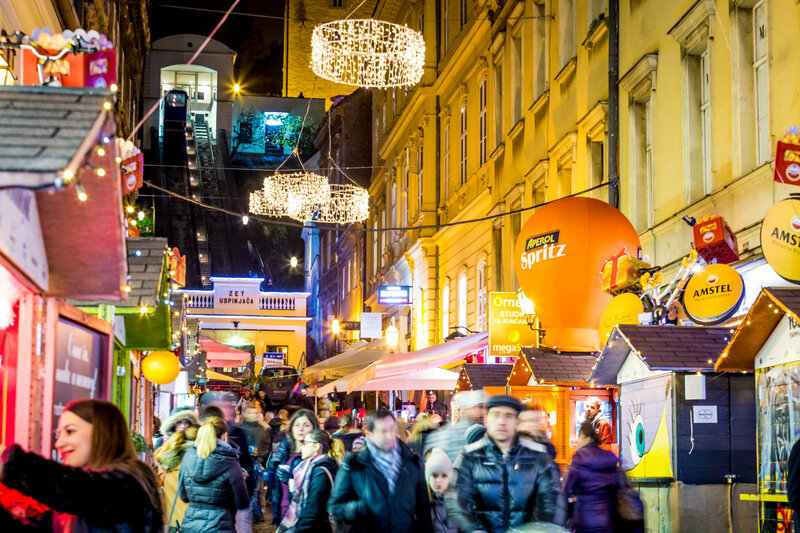 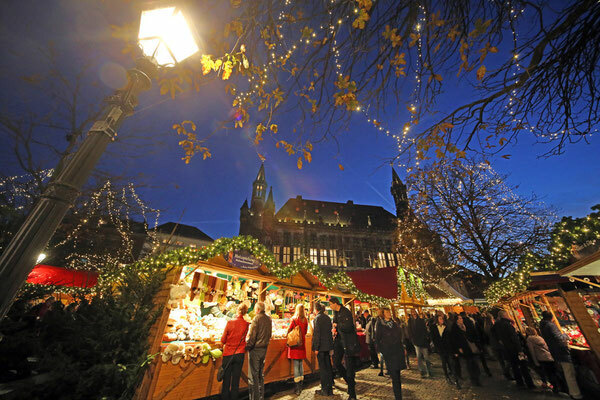 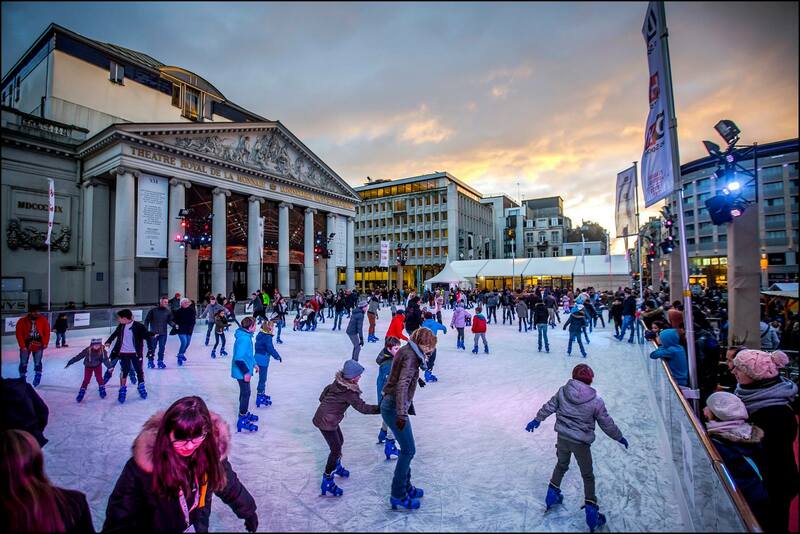 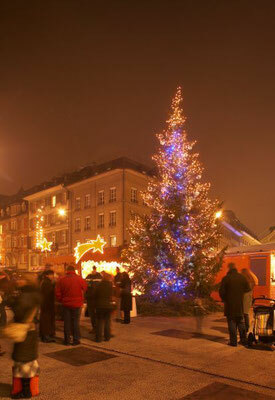 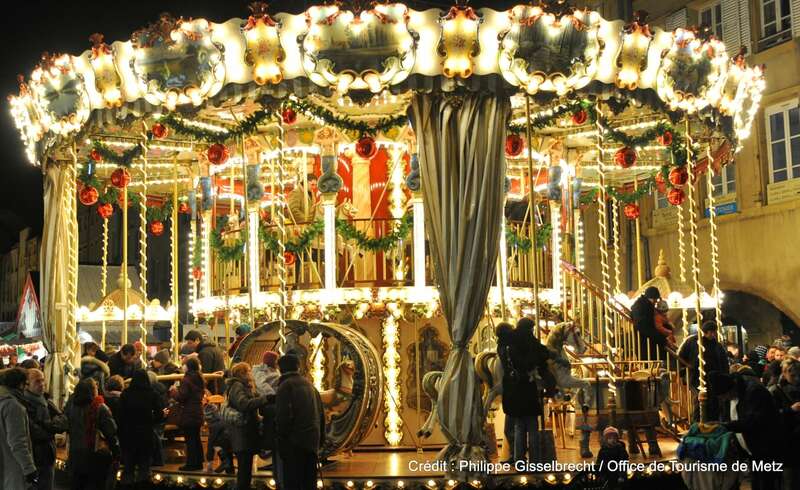 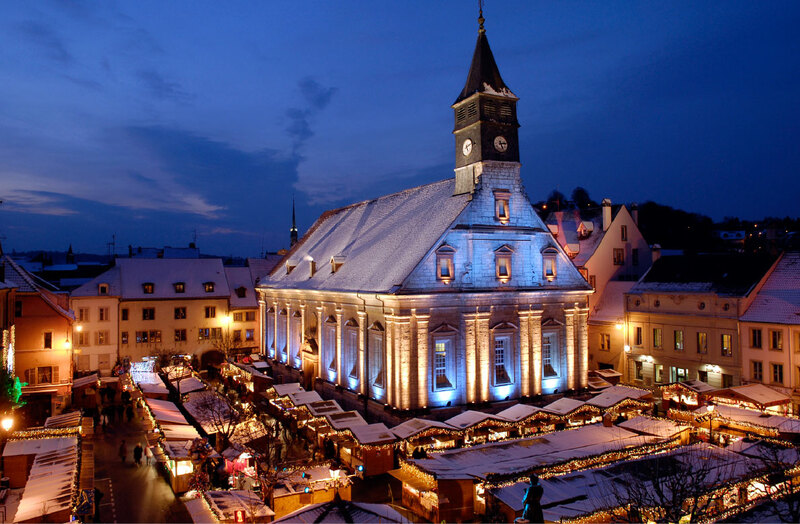 Aachen offers a traditional and gourmet Christmas market in a family atmosphere. Located in Germany, on the border of Belgium and the Netherlands, Aachen is at the crossroads of Europe. 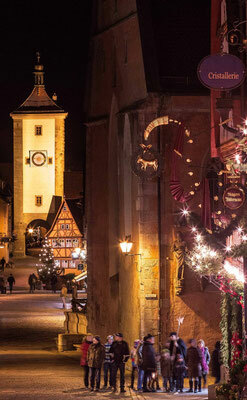 Easy to get to, it's a great destination for Christmas! Every year before Christmas the squares and streets round the Cathedral and the Aachen Town Hall are transformed into a paradise of lights and colours, festive sounds and seductive smells. The glorious fair in the Christmas City, which has been erected with great care and sentiment, fascinates both the young and the old. 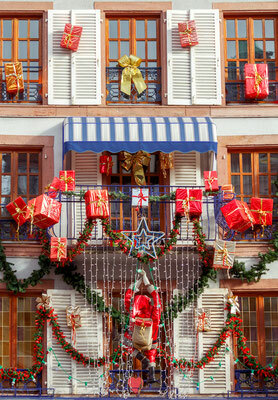 The enormous choice between original, stylish and precious goods makes small and big dreams come true. 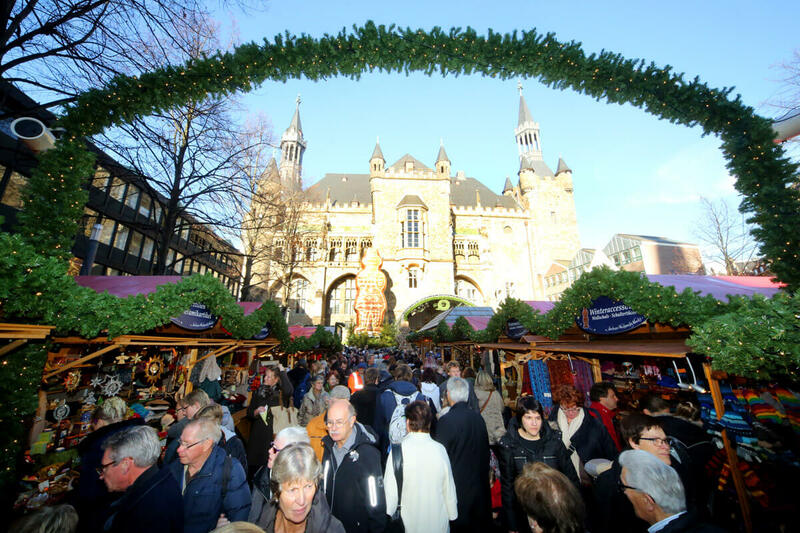 It is really no wonder why the Aachen Christmas Market has become an absolute "must" for all people of Aachen and Aachen fans as well. 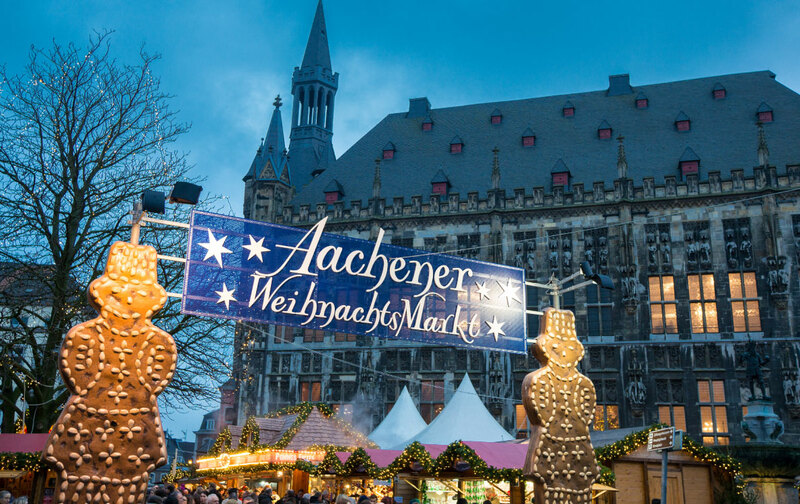 Book your stay in Aachen at the best price guaranteed for a great holiday in the best Christmas market in Germany. You voted for Basel as your favourite Christmas market in Switzerland and one of your favourite Christmas markets in Europe! 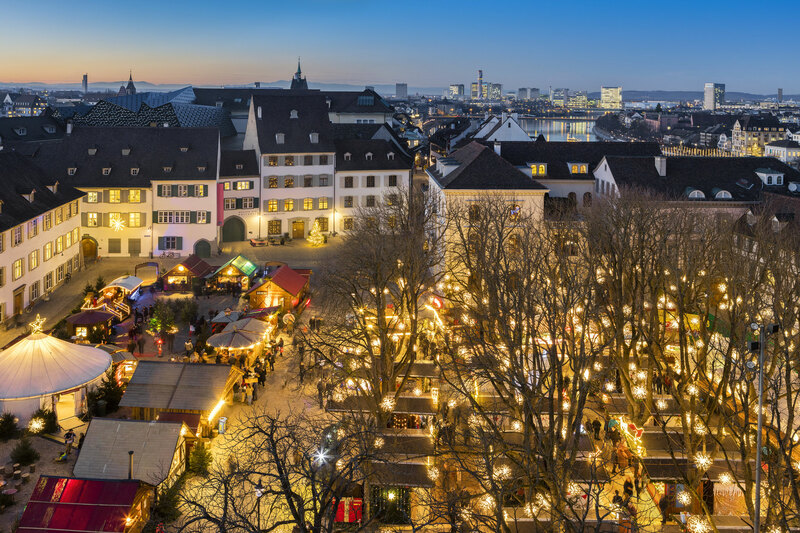 Basel has a deep-rooted tradition as Switzerland’s most beautiful and largest Christmas city, and is well worth a visit every year. Not only the well-preserved Old Town is radiant in the warm Christmas light, but the shops and the facades of many buildings glitter with a golden glow. 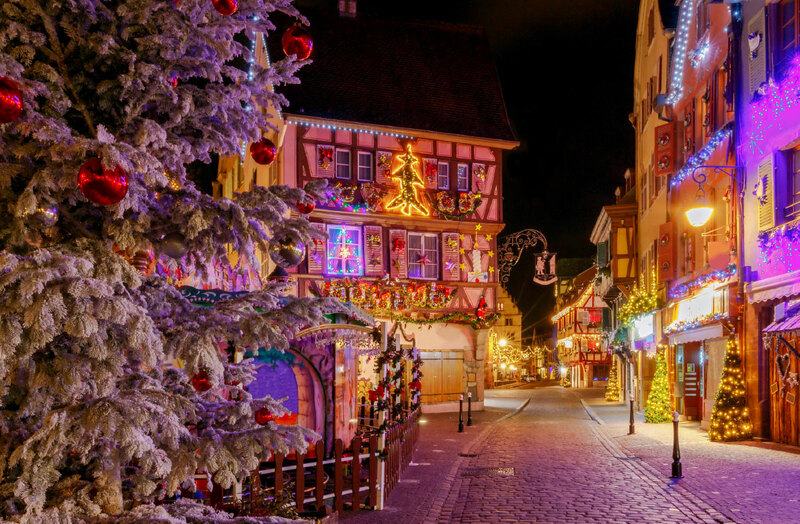 Roughly a hundred tall pine trees border the streets and stand like brightly lit sentinels pointing the way for the visitor. 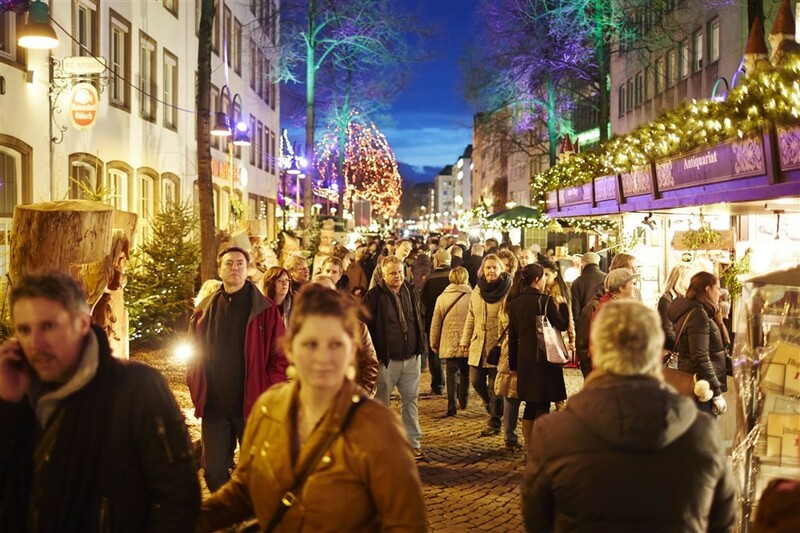 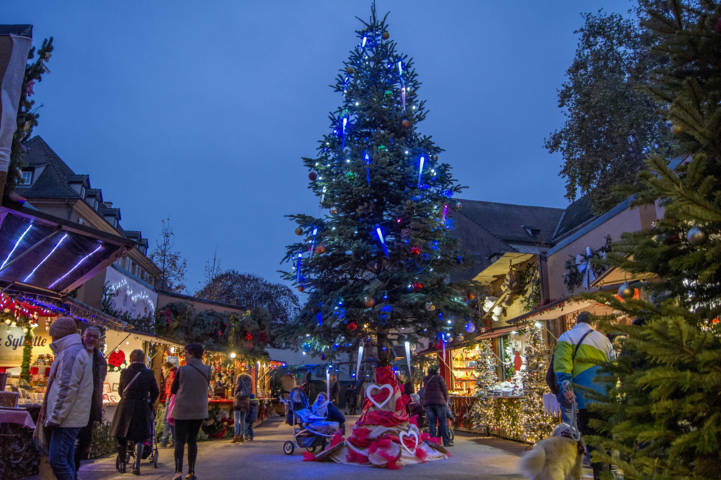 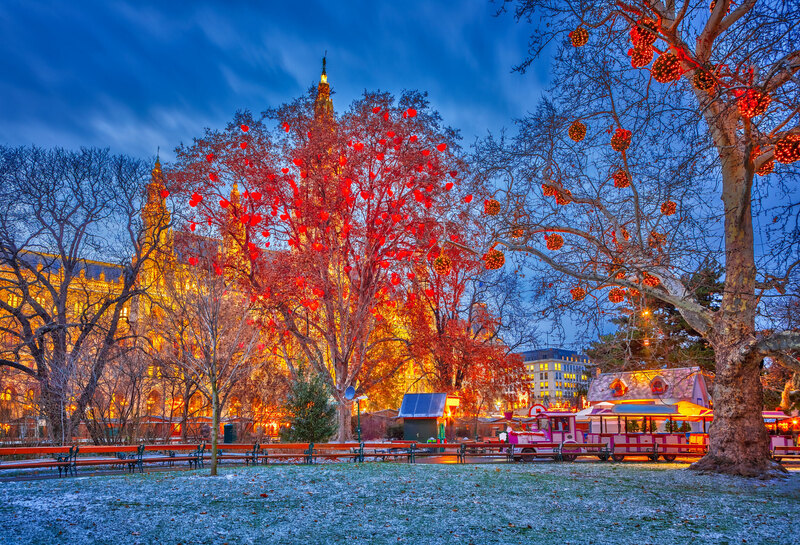 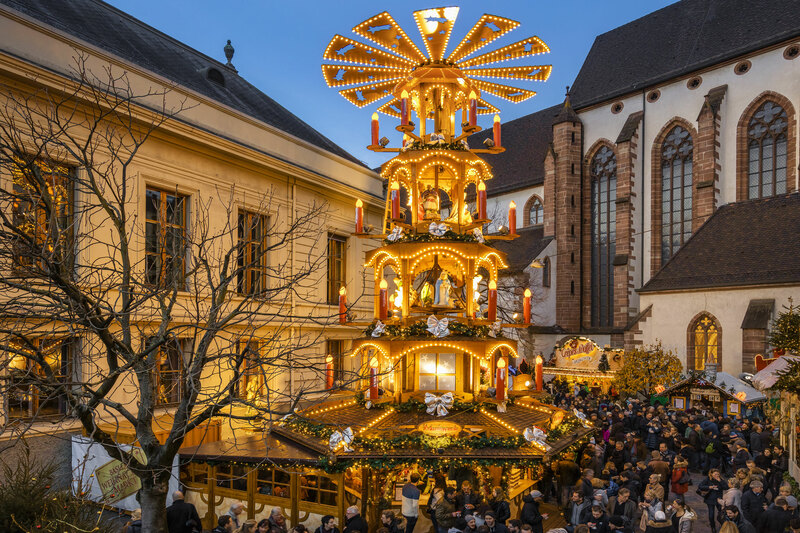 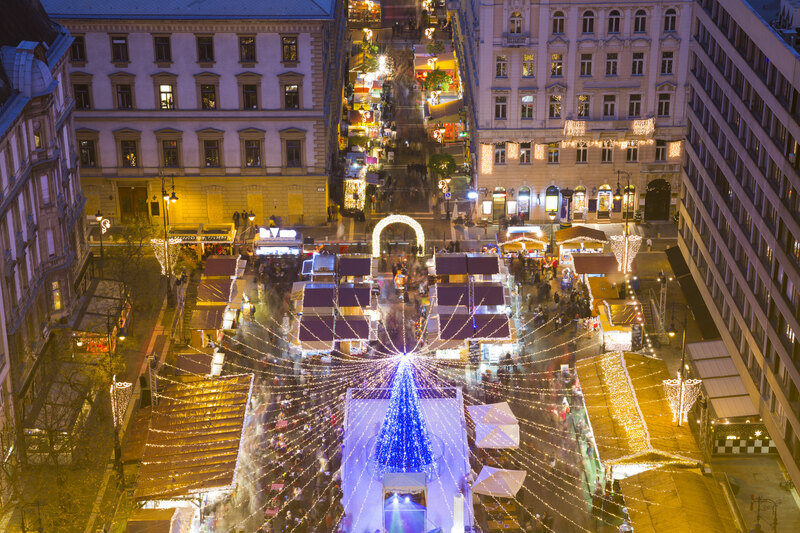 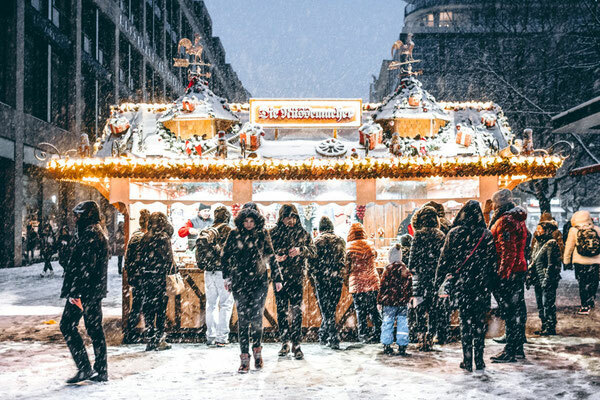 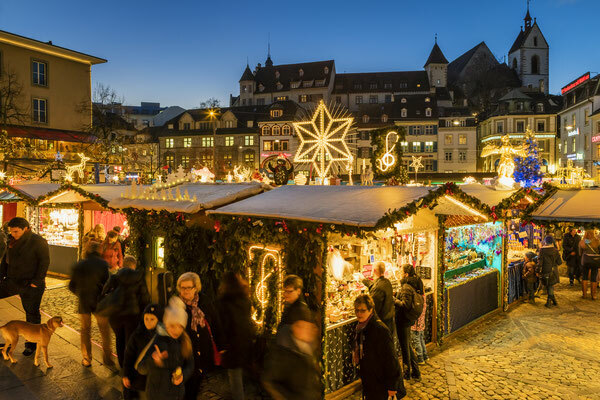 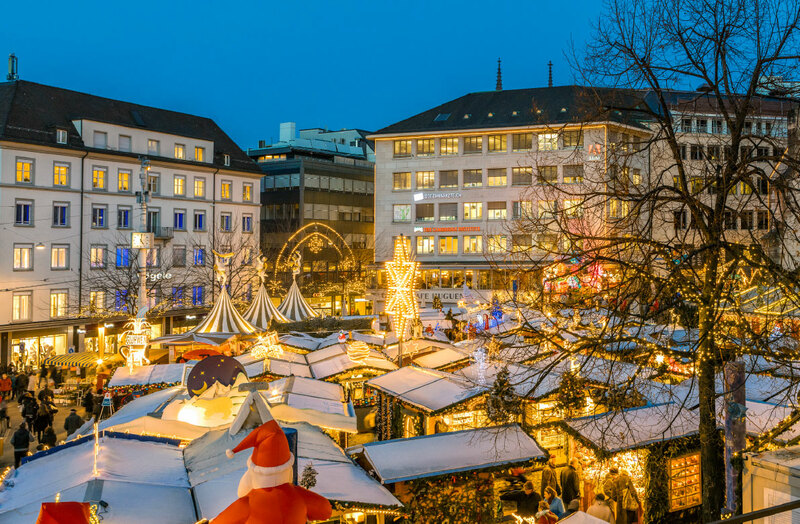 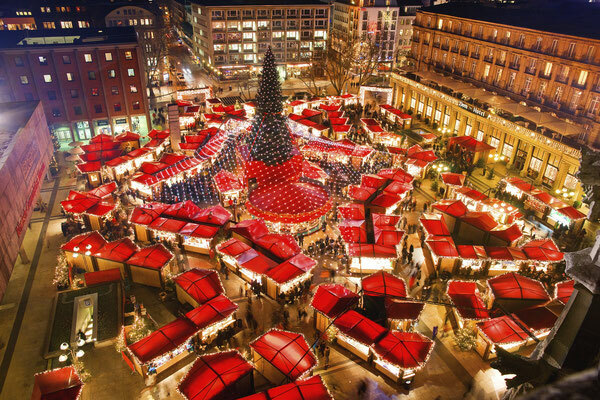 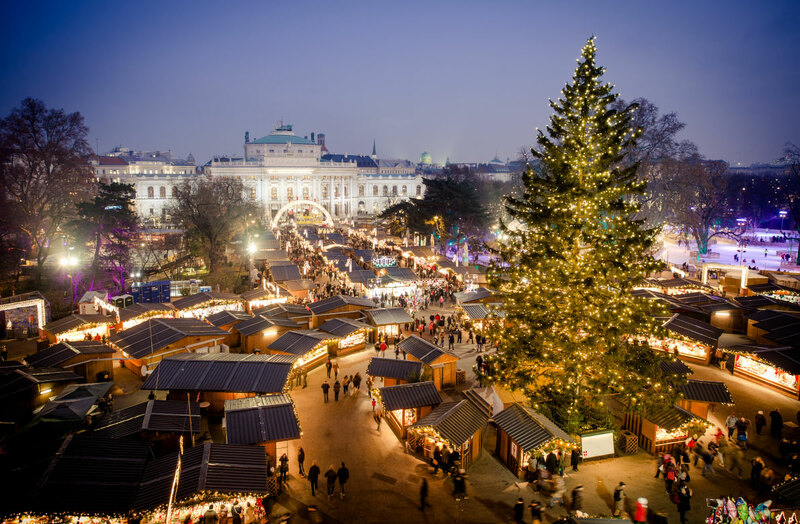 Particularly recommended is the Christmas market, which is being held not only on Barfüsserplatz, but also on Münsterplatz – one of the most beautiful squares in Basel. 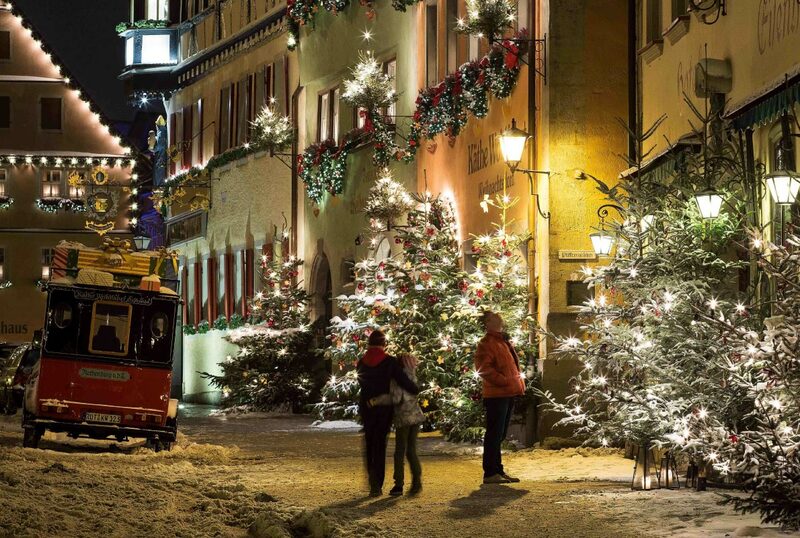 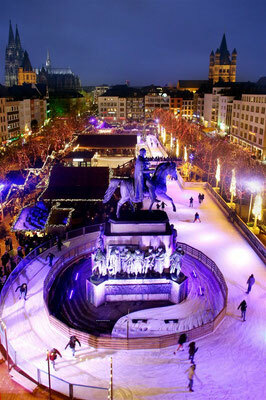 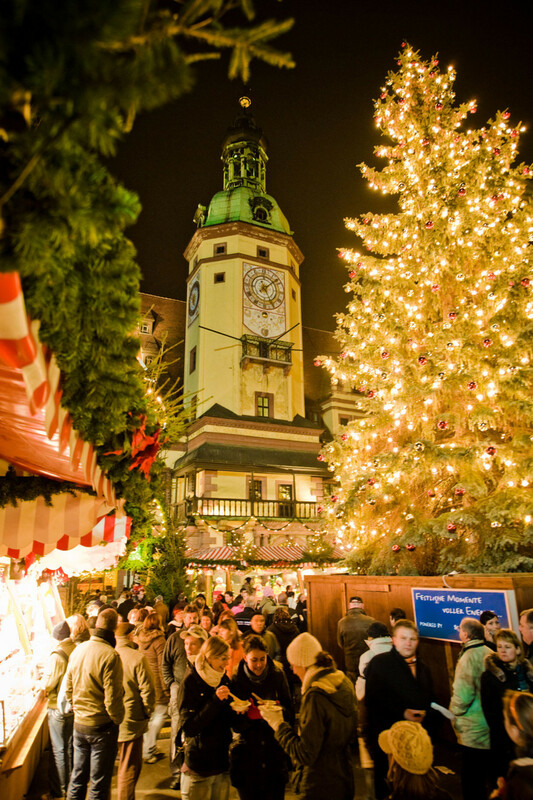 Book your stay in Basel at the best price guaranteed for a great holiday in the best Christmas market in Switzerland. 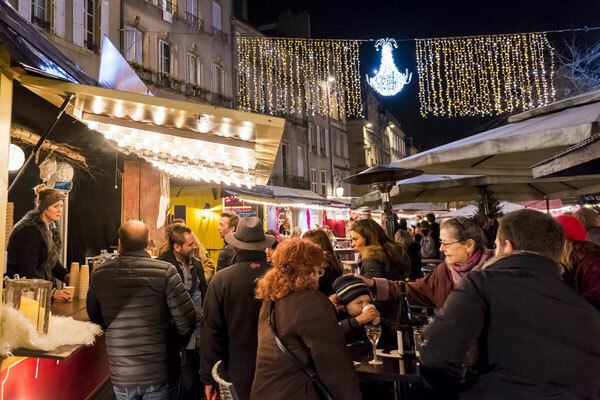 Regular participant in this competition, the Metz Christmas Market, which is one of the most beautiful Christmas markets in France, was classified by travellers worldwide in the top of the best Christmas markets in Europe. 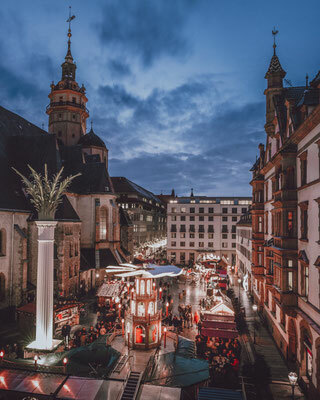 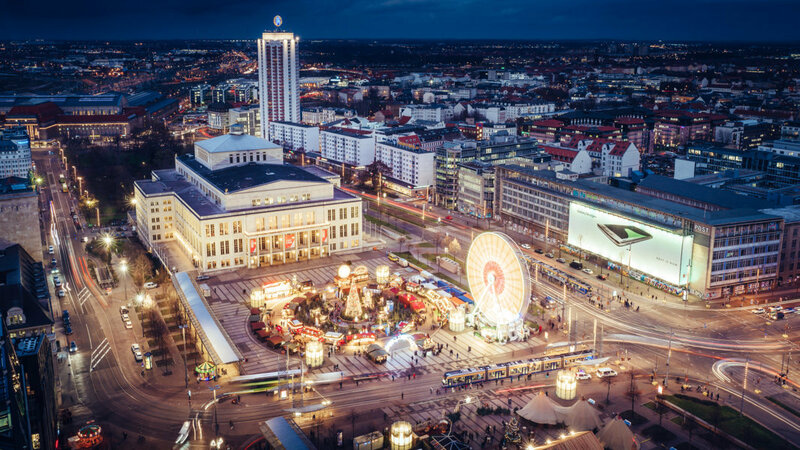 Get into the spirit of the festive season and enjoy the warmest of welcomes as you visit the Christmas markets on the city’s six main squares. 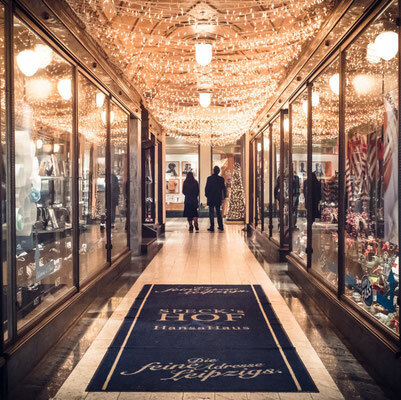 Find hand-crafted gifts in the Christmas pyramid and taste the finest gingerbread around. 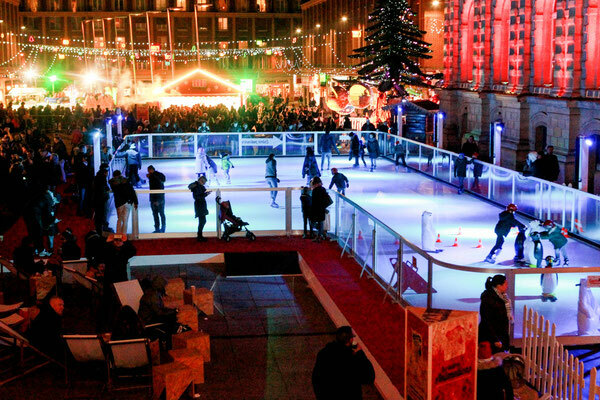 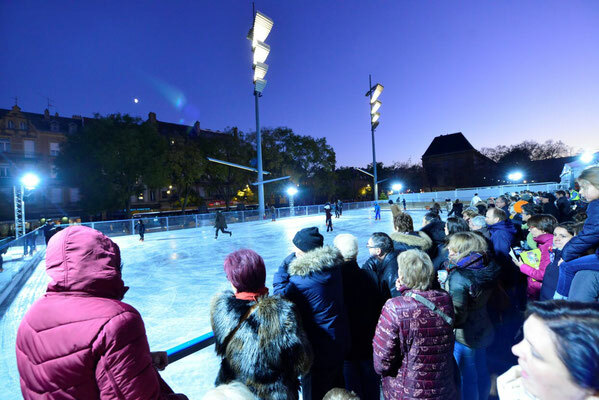 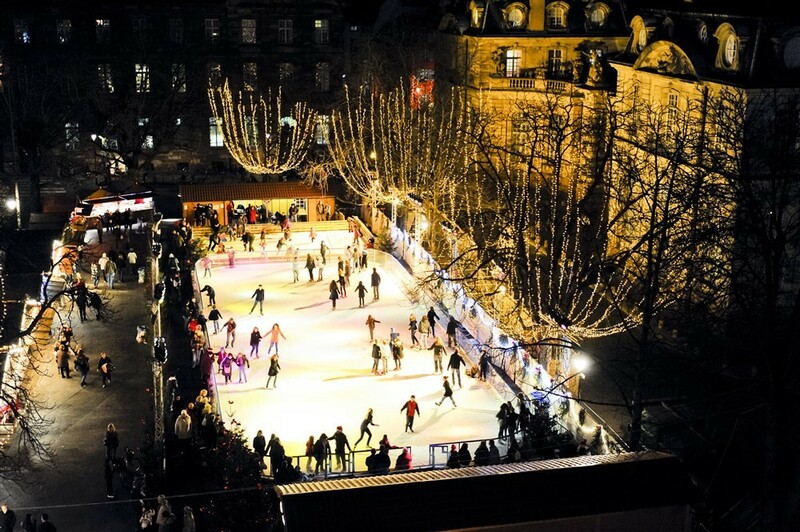 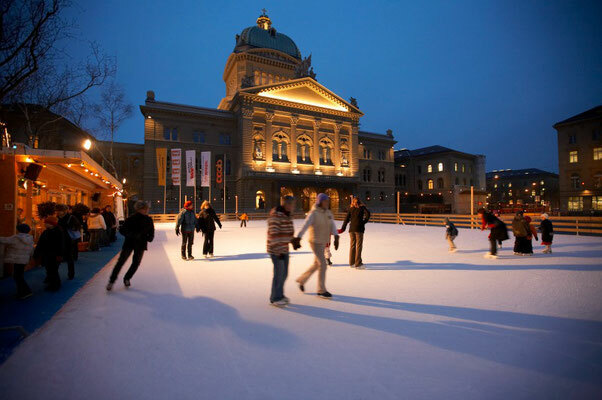 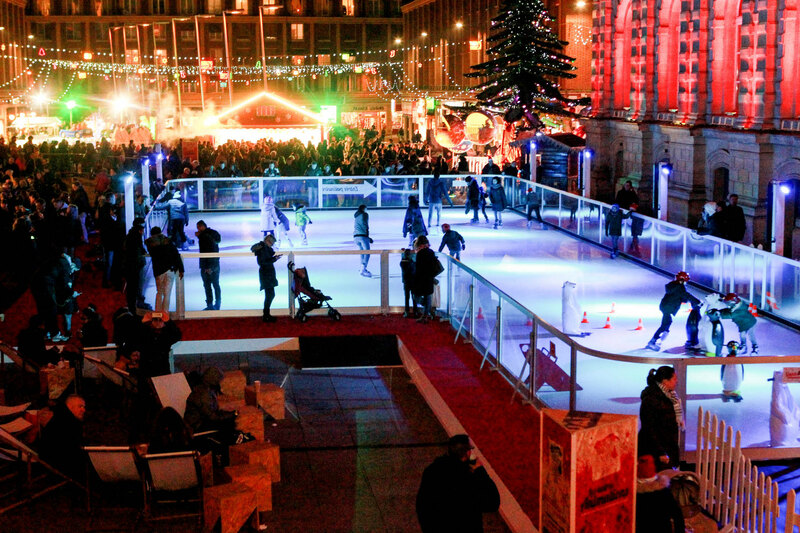 Take a turn around the open-air ice-rink, then warm up cold hands around a mulled wine or hot chocolate. 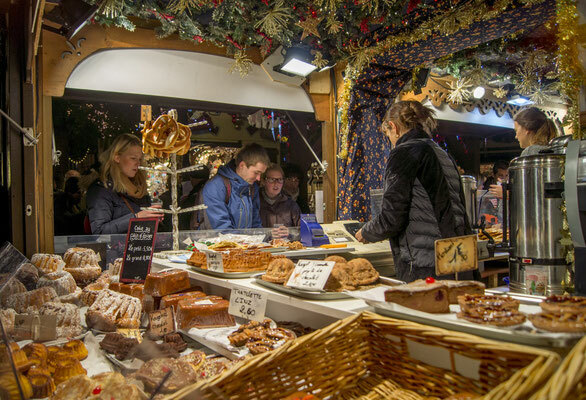 Let the illuminations chase away the dark winter days, and enjoy traditional treats like the merry-go-round, a walk through the magical "Sentiers des lanternes" or take the chance to stock up on gastronomic Christmas essentials at the city market hall. 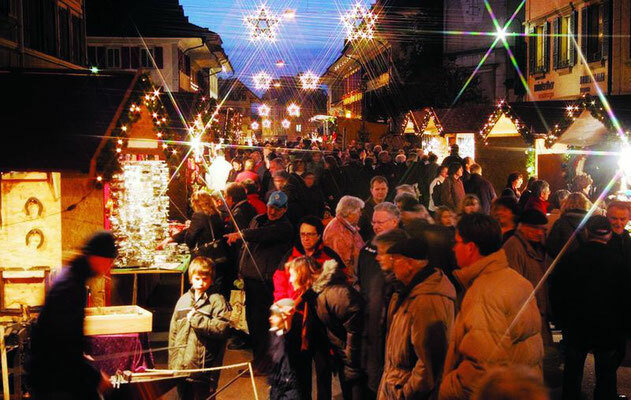 If you are here on the 1st & 2nd of December, don’t miss out on the St Nicolas festivities! 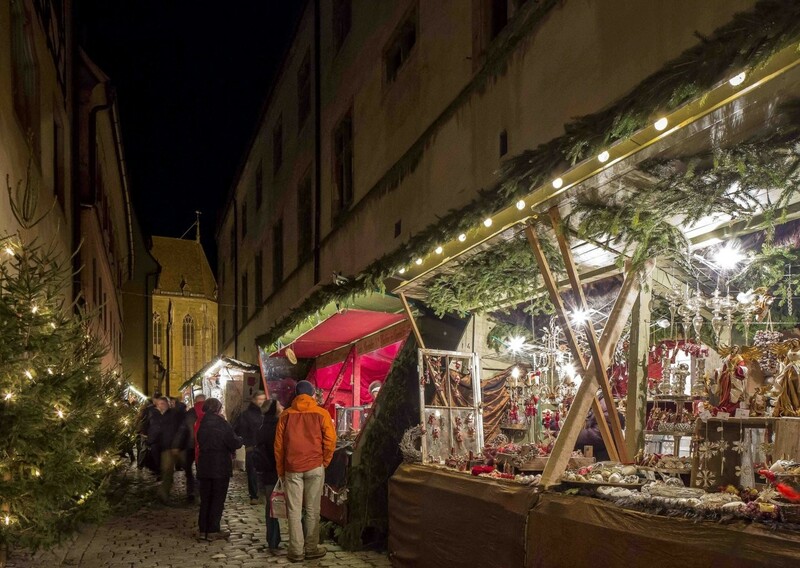 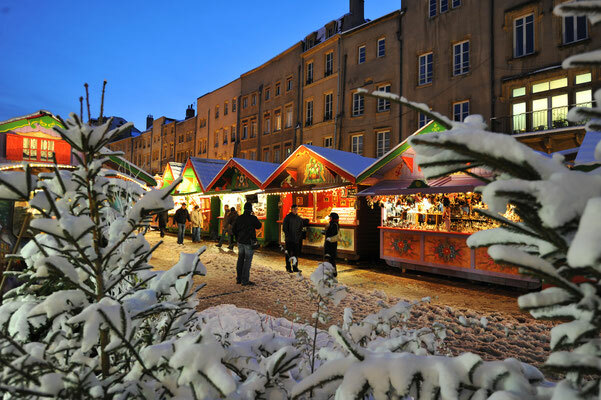 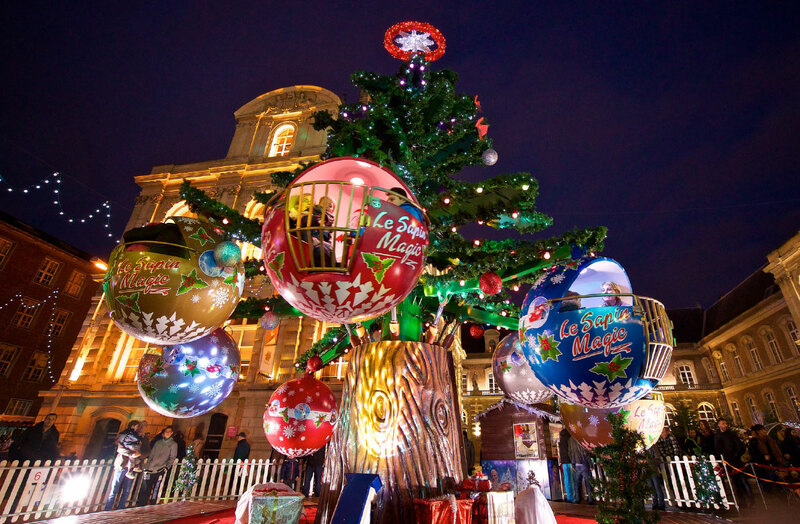 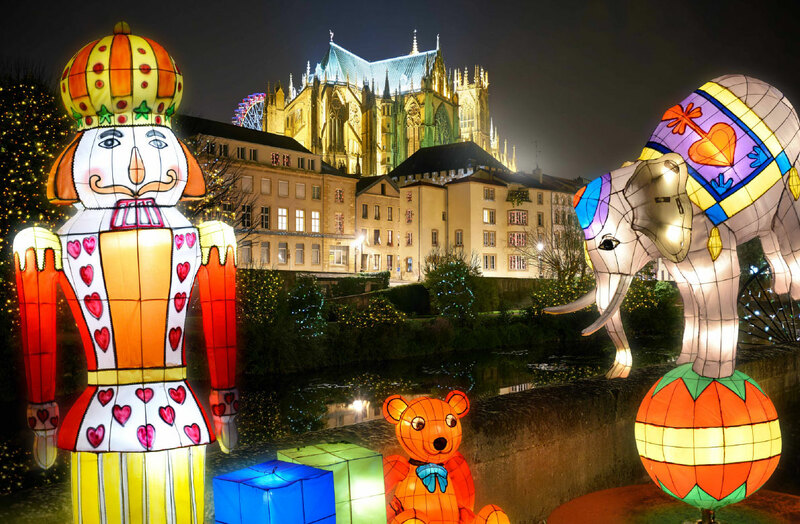 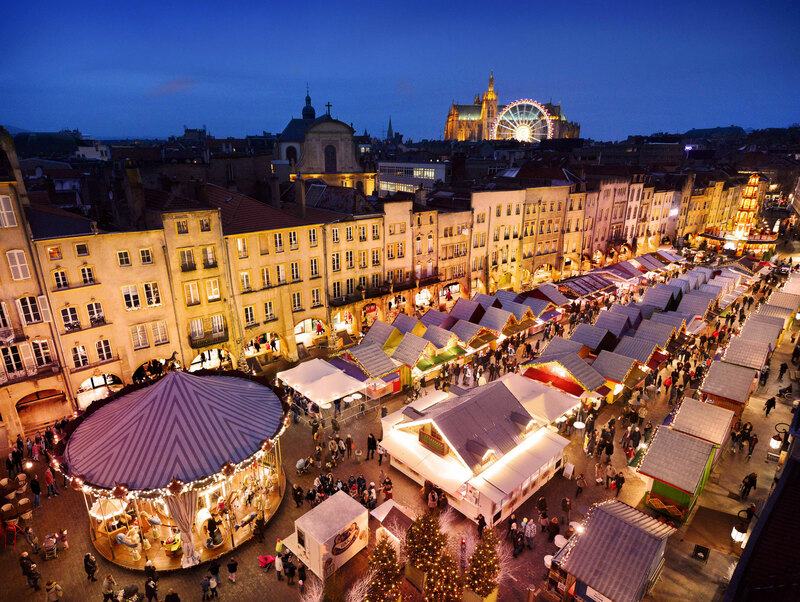 Discover this wonderful Christmas market and book your stay in Metz. 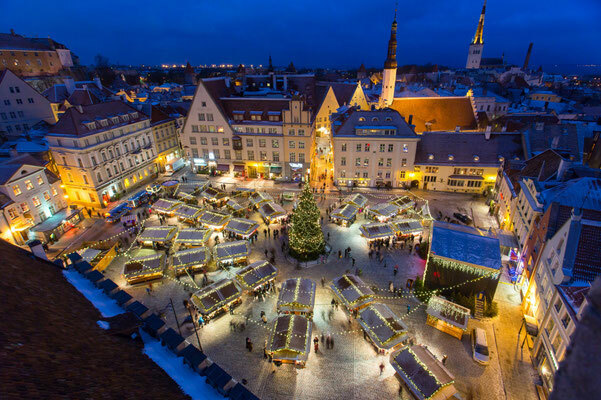 Every year, more than half a million people, guests, and inquisitive people visit the Tallinn Christmas Market from close by and from far away. 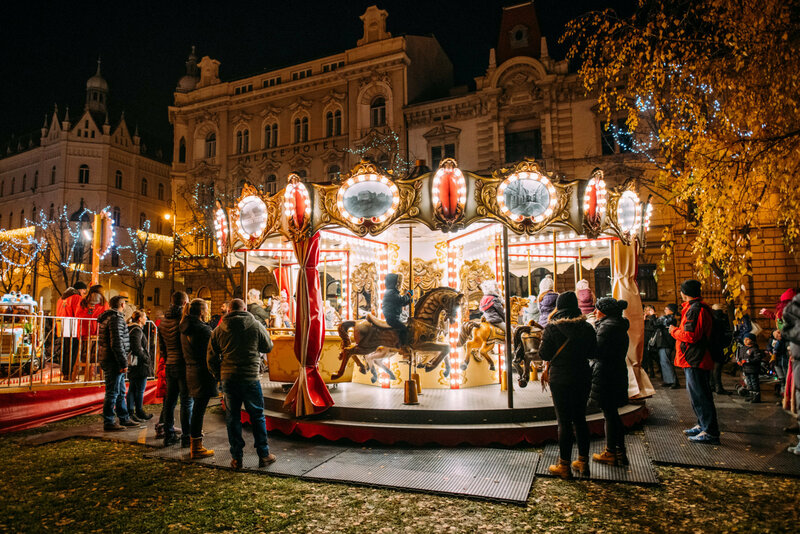 For children, entertainment is provided by carousels and Santa Claus, who distributes candy in his little house to those who are better at reciting verses. 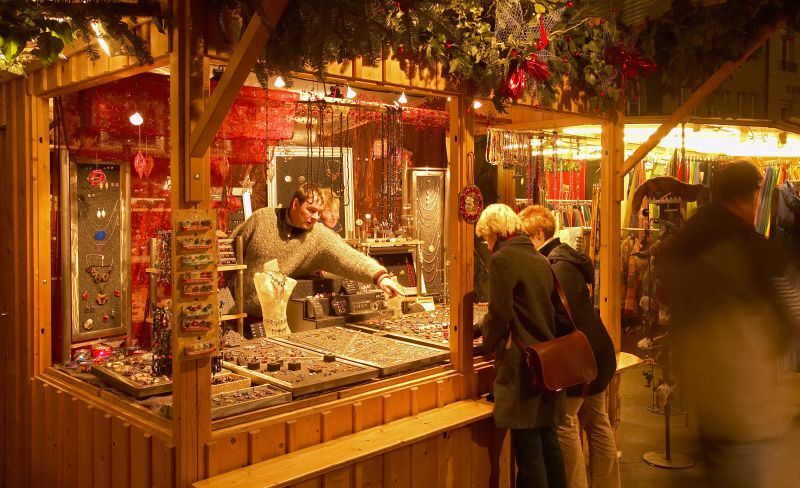 At the site, you can buy high-qualityhandicrafts fromall sorts of nick-nacks to practical winter accessories, andyou can fill your tummy with gingerbread and with hearty Christmas roasts. 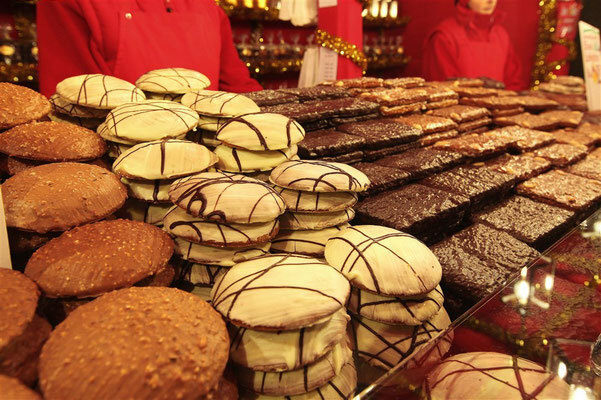 Among the refreshments are well known Christmas dishes, but also brand new ones that are perfect for Christmas time. 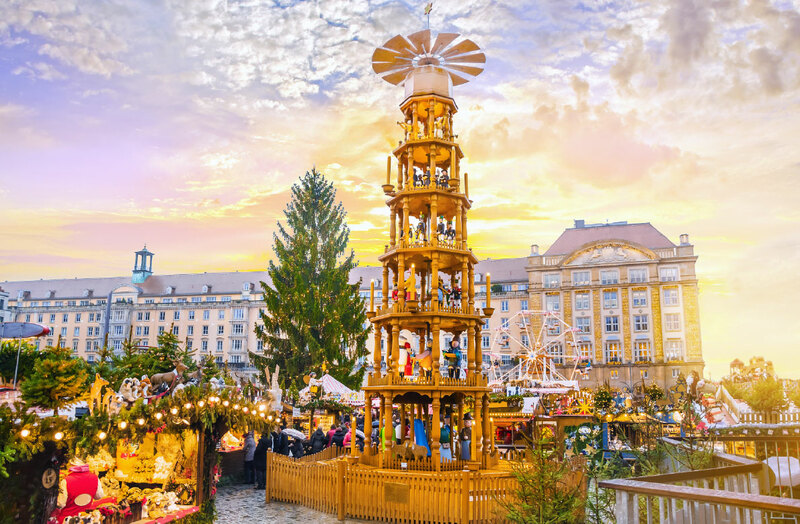 Over the Town Hall Square drifts a spicy scent of mulled wine – this hot Christmas drink is served in a very broad assortment, with different flavors, both for children and adults. 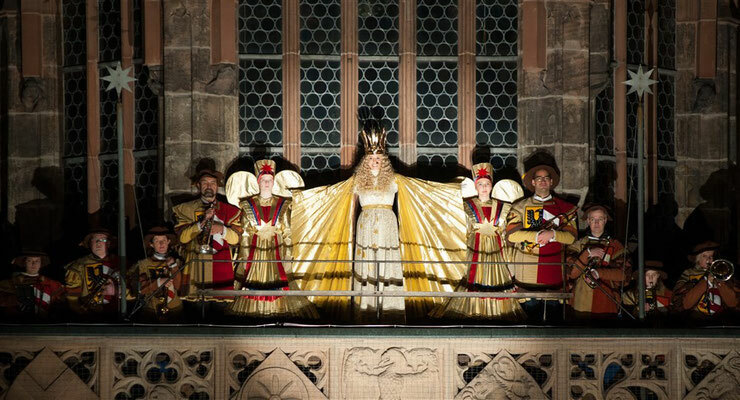 The Christmas spirit is heldup, as always, by a special cultural program. 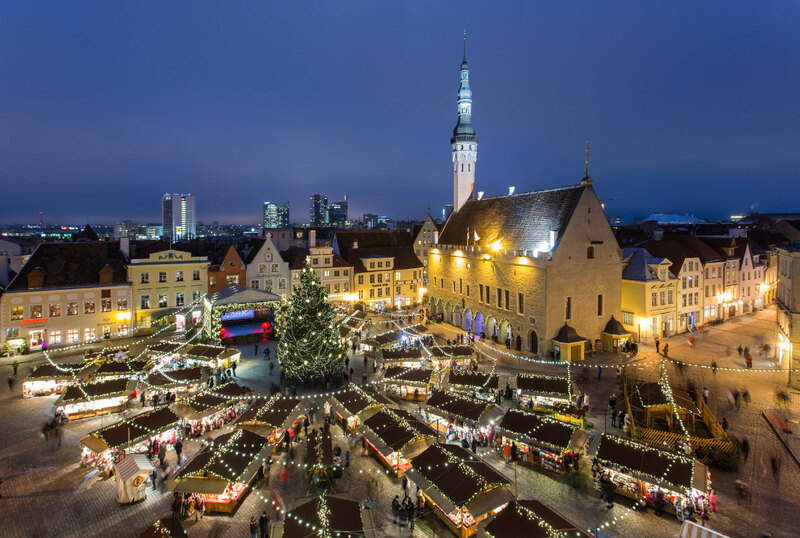 At the weekends, different groups from both Estonia and abroad appear on the stage of the Christmas Market, with around 3000 performers appearing on the stage. During the Advent period, an Advent candle is lit every Sunday, church leaders and city leaders greet the people. 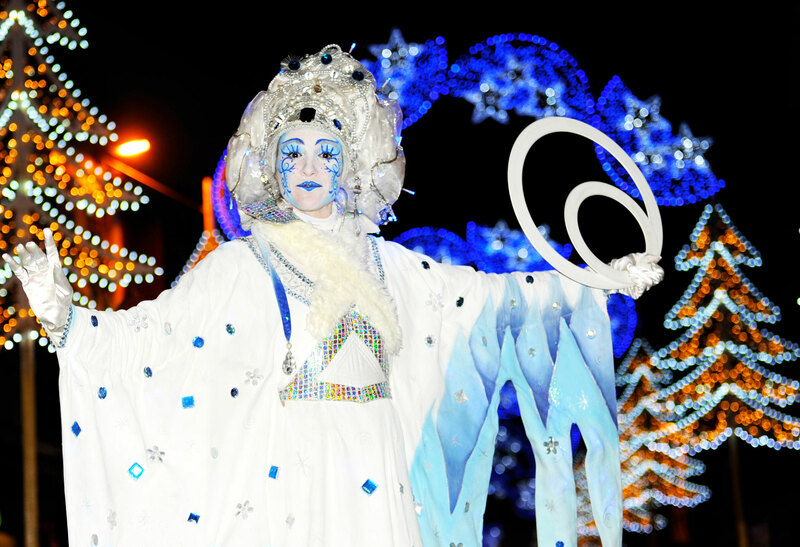 A spirited special program is planned for the New Year’s Eve! 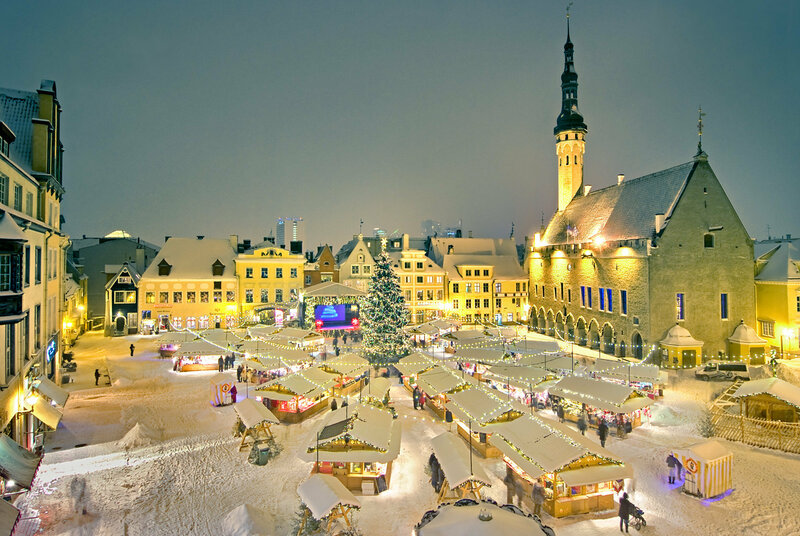 Discover the Tallinn Christmas Market and book your hotel at the best price guaranteed for an unforgettable experience in one of the most beautiful Christmas markets in Europe. 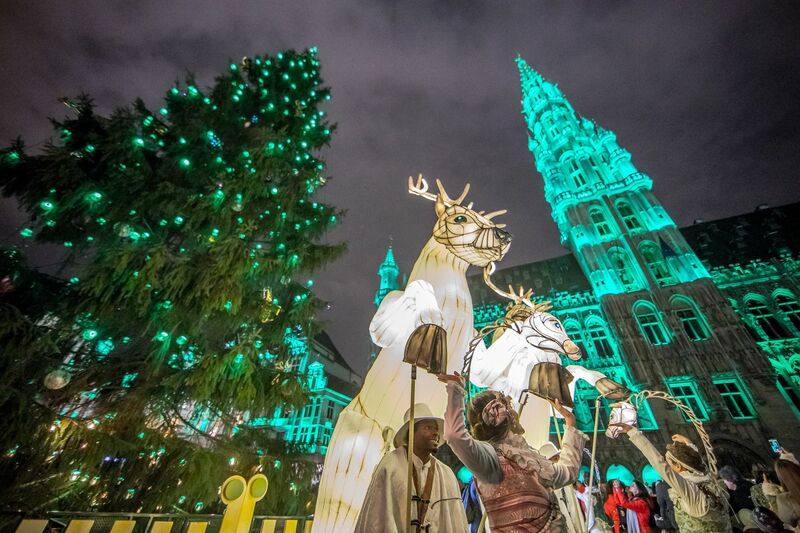 The most beautiful Christmas market in Belgium is also one of the best Christmas markets in Europe. 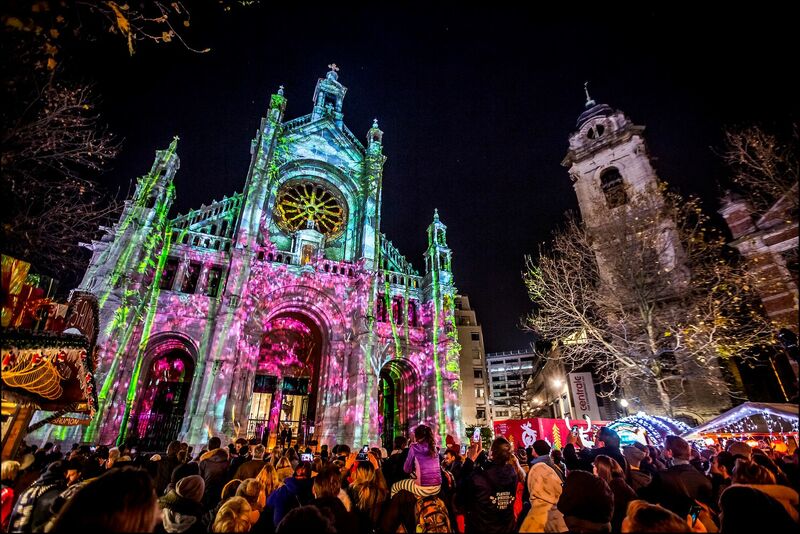 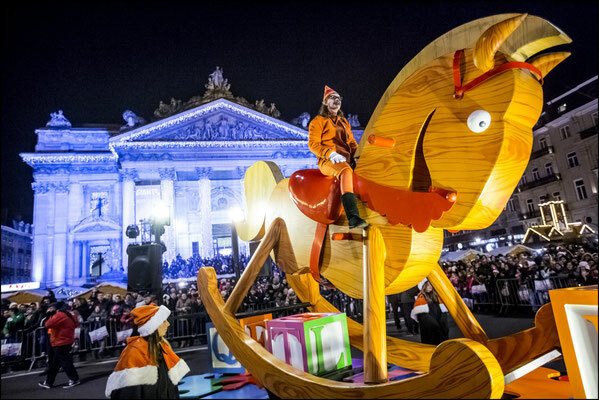 Travellers who discover the magic atmosphere of Christmas in Brussels are not mistaken : more and more people enjoy this event. 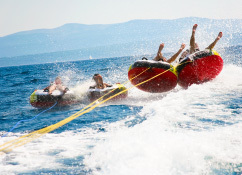 "Winter Fun" has become one of the largest and most popular events in Europe ; it brings together hundreds of thousands of travellers. 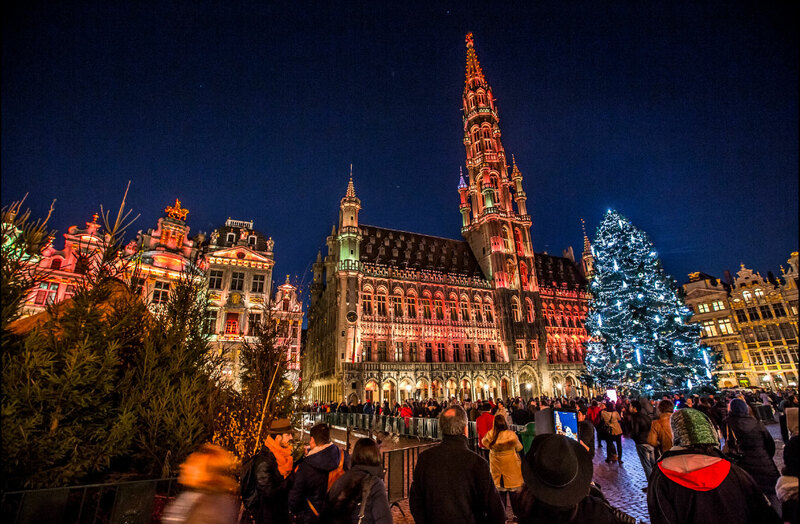 This unmissable happening greatly contributes to make Brussels a privileged city-trip destination. The ice-skating rink, a gorgeous Christmas tree, a magical and original light and sound show, videomappings, a festive Christmas Parade, the traditional Ferris wheel, the merry-go-rounds… All these amazing activities enchant big and small alike and make the course unique. 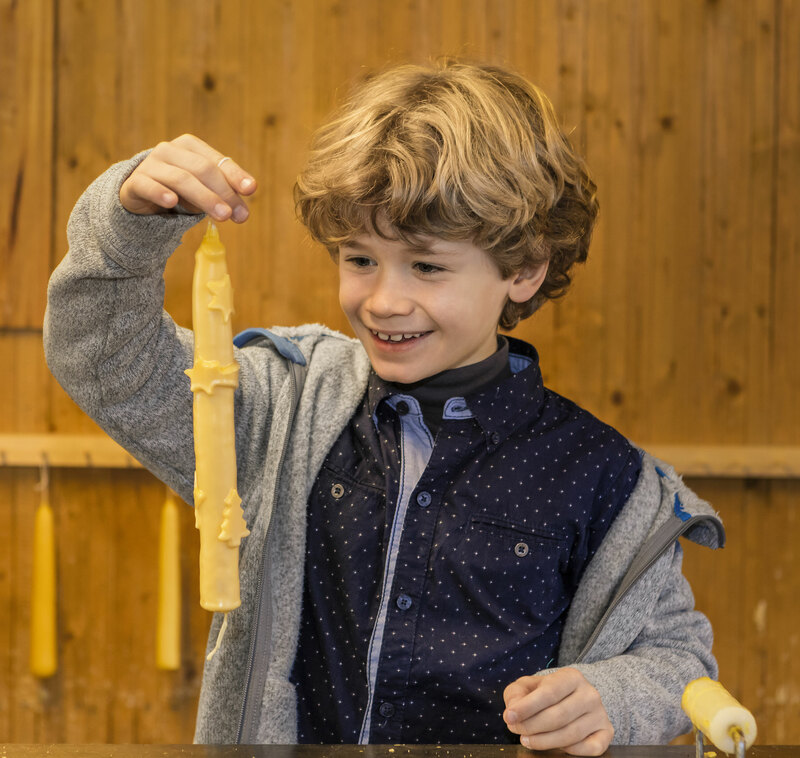 Discover this wonderful Christmas market and book your hotel, B&B, apartment at the best price guaranteed and your best activities in Brussels such as a chocolate creation workshop! 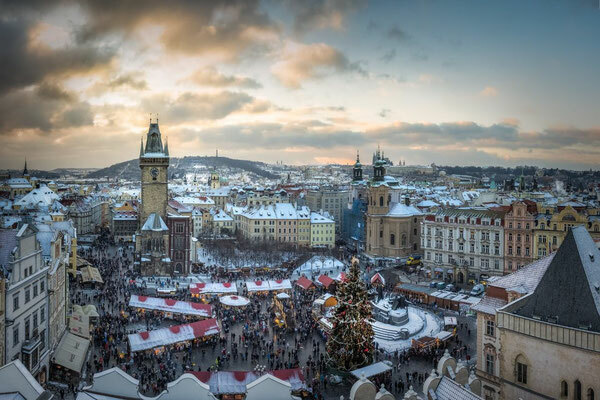 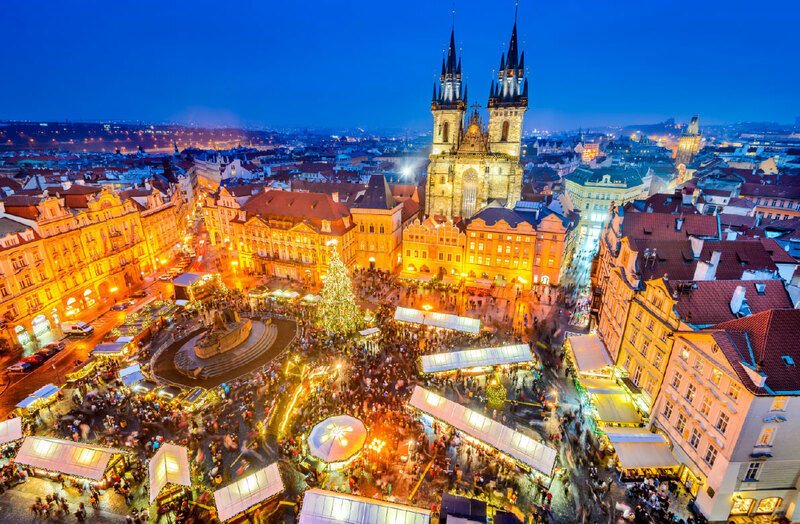 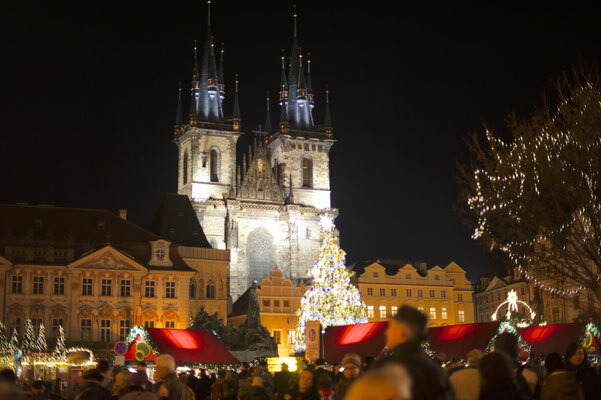 The best Christmas market in the Czech Republic welcomes travellers from all over the world each year ; they are amazed by the beauty of the city dressed in Christmas colours. Prague is incredibly romantic all year round ; it is ranked among the most romantic cities in Europe and is even more charming at Christmas time. 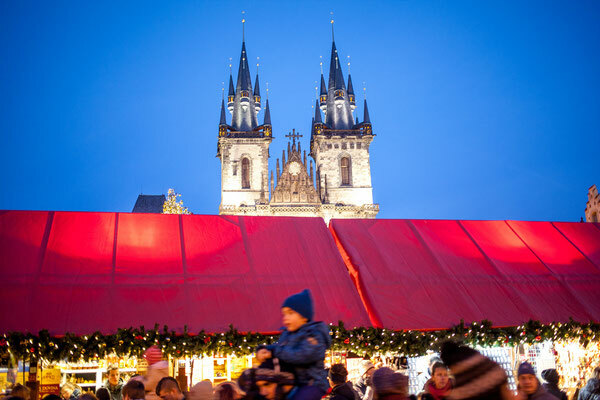 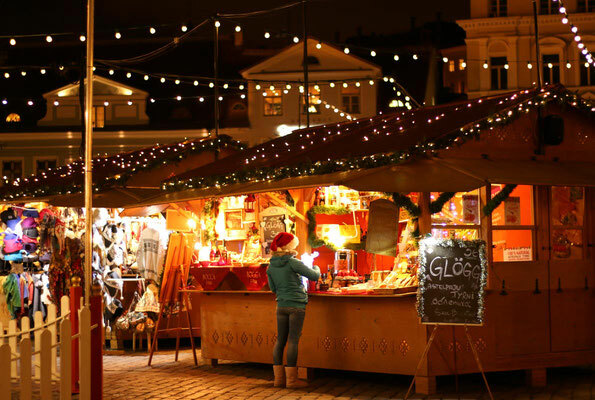 Come discover this Christmas market with friends, family or lover and book your stay and your plane tickets at the best price guaranteed as well as your best activities in Prague such as a dinner cruise. 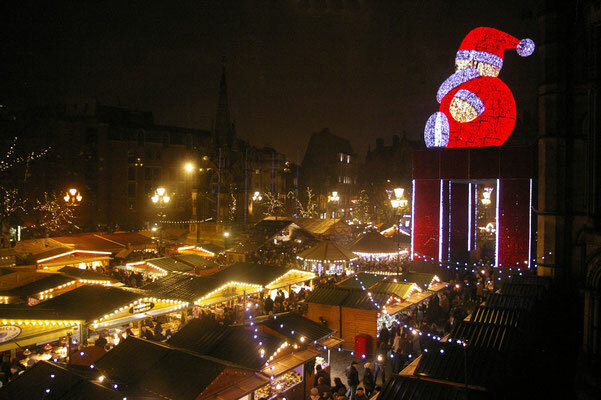 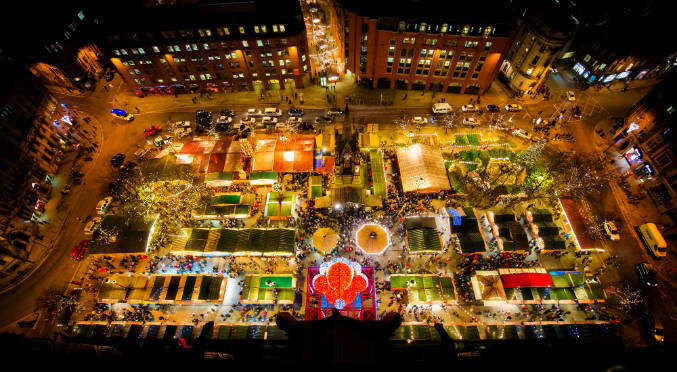 You have been choosing Manchester as your favourite Christmas market in the UK and one of your favourite Christmas markets in Europe for several years now. 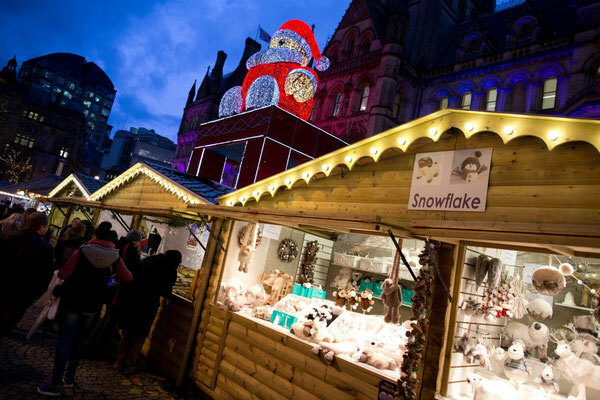 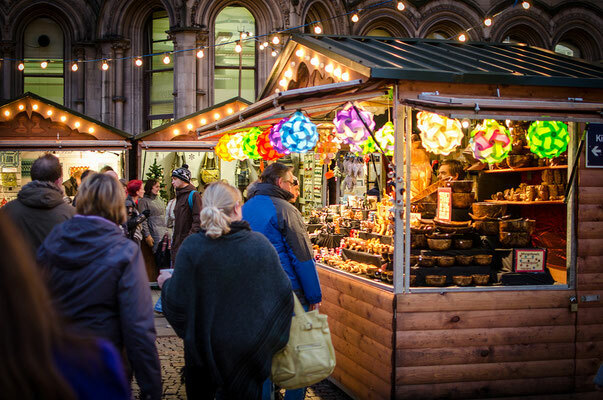 The, original, biggest and - arguably - the best Christmas market in the country, Manchester Christmas Markets is the ideal destination for a festive outing. 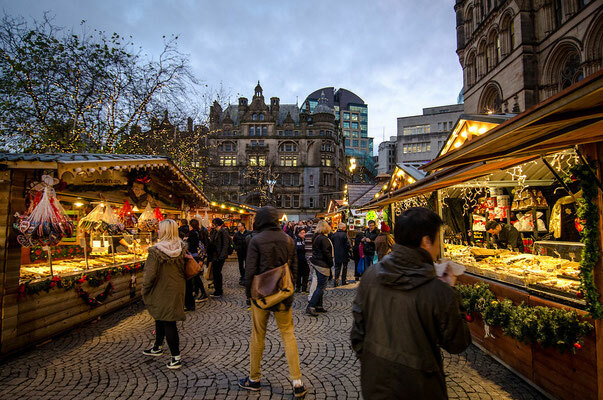 Arriving in the city in 1999, the first Christmas market in the UK has grown every year since, now attracting more than nine millions visitors each year. 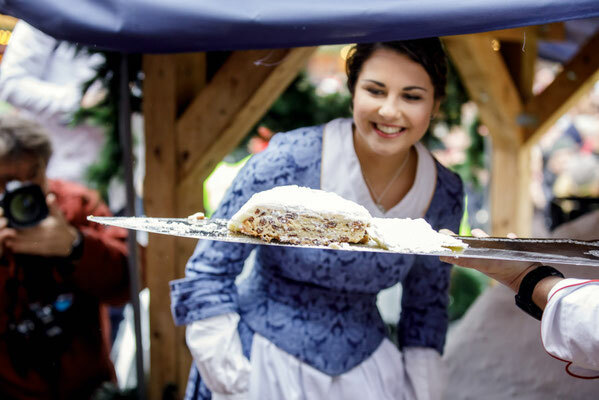 Some 300 beautifully crafted stalls offer mouth-watering international food, drinks and finely crafted Yuletide gifts in the heart of the buzzing city centre. 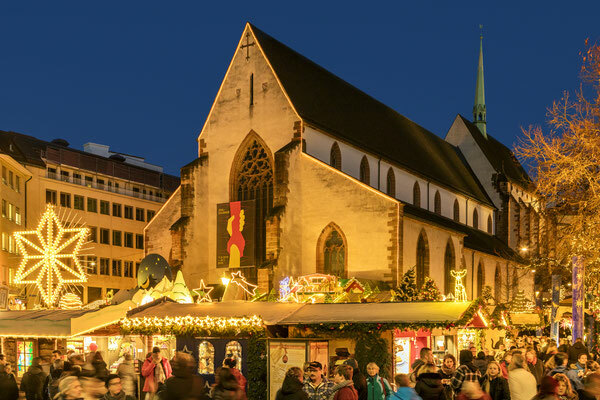 Travellers especially appreciate the authenticity of this traditional Christmas market, probably more authentic and warm than the one in London. 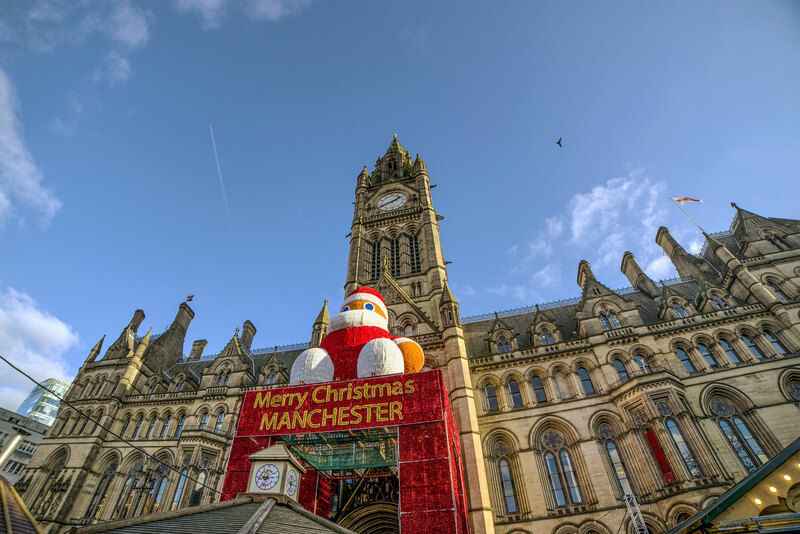 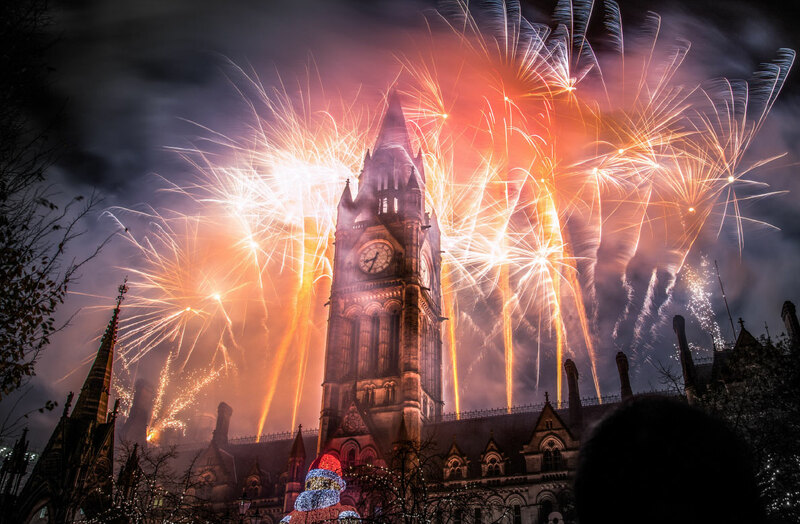 Discover the magic of Christmas in Manchester and book your stay at the best price. 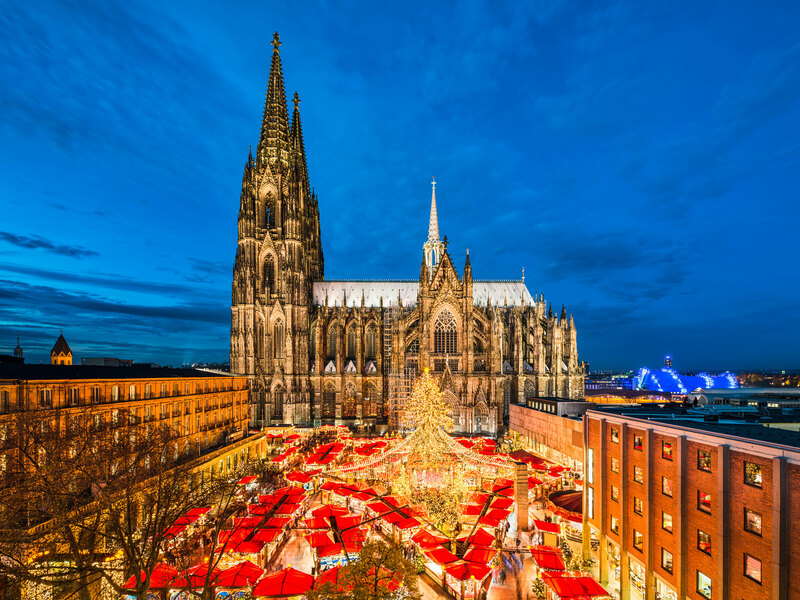 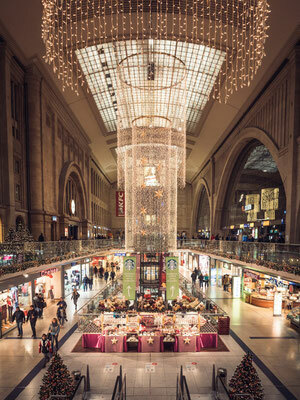 Cologne is one of travellers’ favourite Christmas destinations ; it is not only one single Christmas market but several different Christmas markets spread throughout the city. 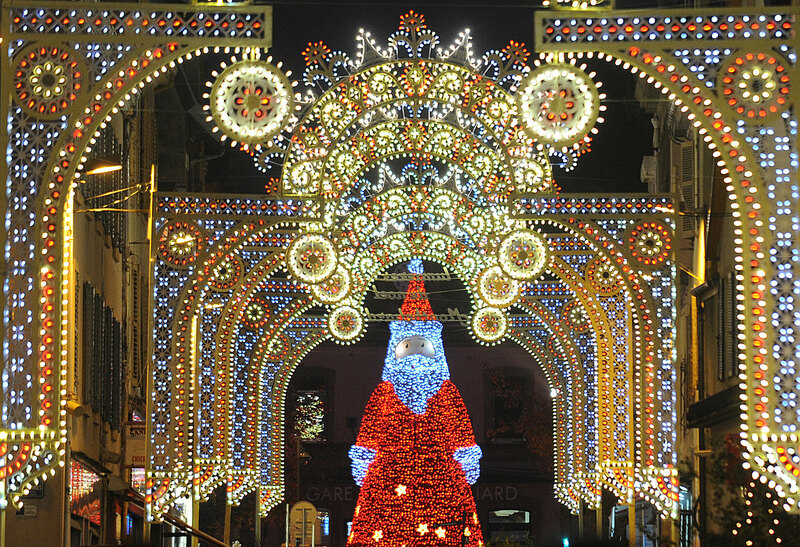 The whole city is dedicated to Christmas at this time of the year. 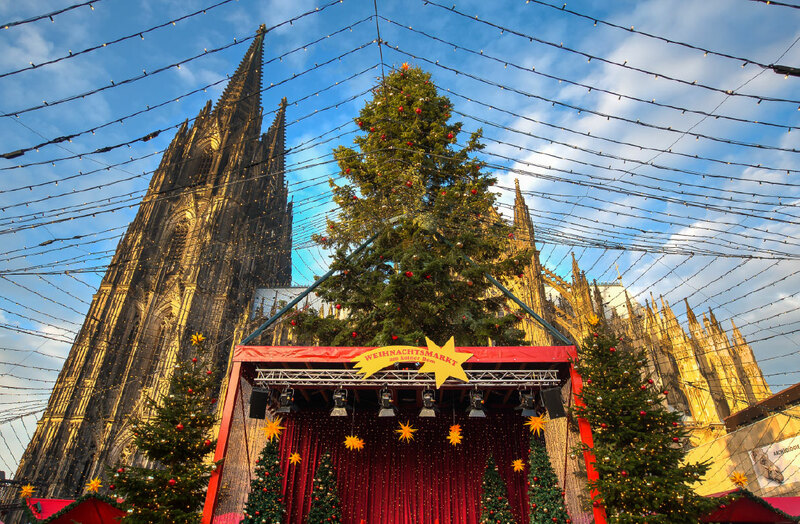 Visit Cologne in December and enjoy an exceptional and successful Christmas holiday. 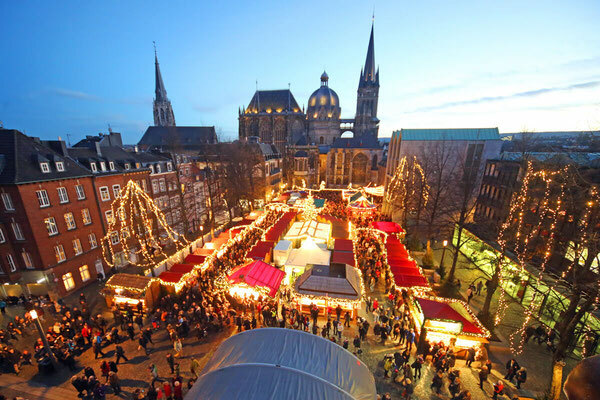 Advent is the time for Christmas markets, and Cologne is no exception, the magic of Christmas will be felt throughout the festively decorated city. 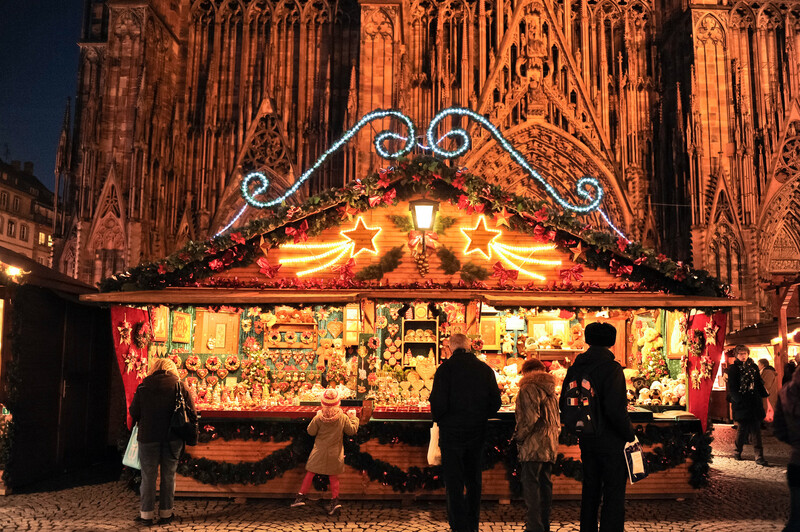 The aroma of baked apples, cinnamon biscuits and mulled wine will waft through the alleys, and many differently themed Christmas markets will invite people to stroll, shop and explore. 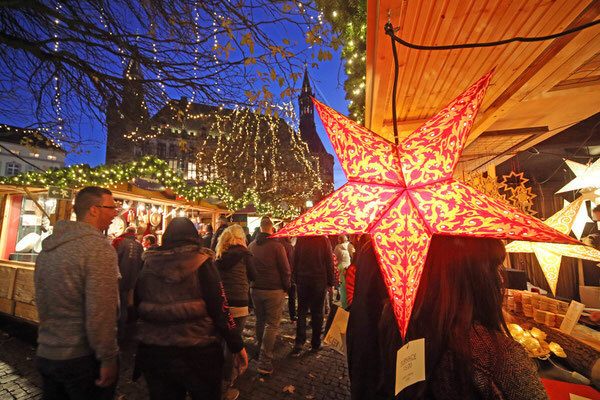 The larger Christmas markets are held in downtown Cologne, but Cologne’s smaller Christmas markets also have plenty to offer. Cologne’s Christmas markets attract millions of visitors from all over the world every year. 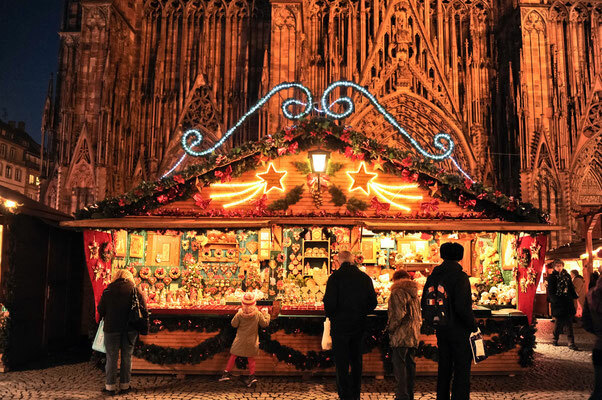 You too can savour the unique atmosphere of this metropolis on the Rhine at this special time of year. 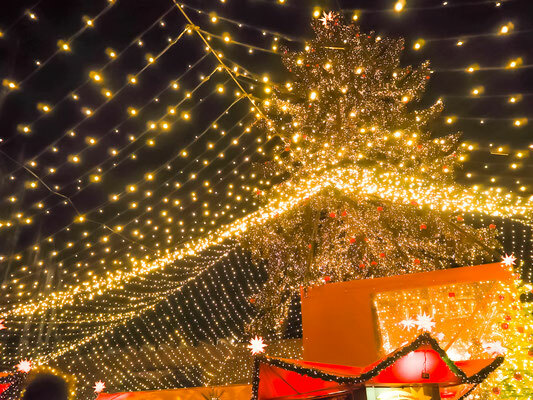 You’re sure to be enchanted! 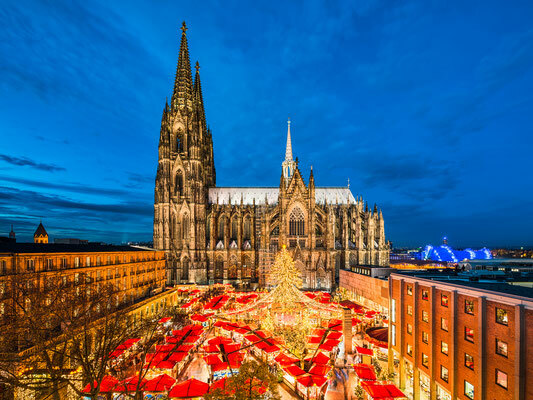 Discover the most beautiful images of the Christmas market in Cologne and book your stay at the best price guaranteed. 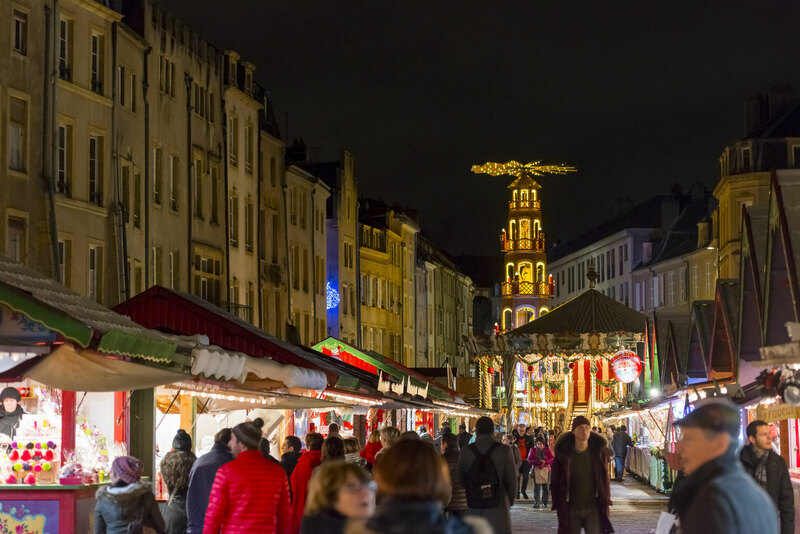 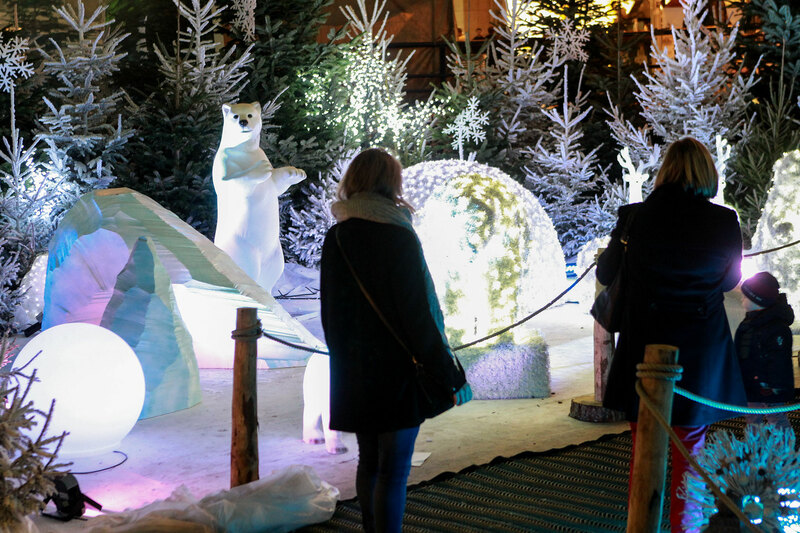 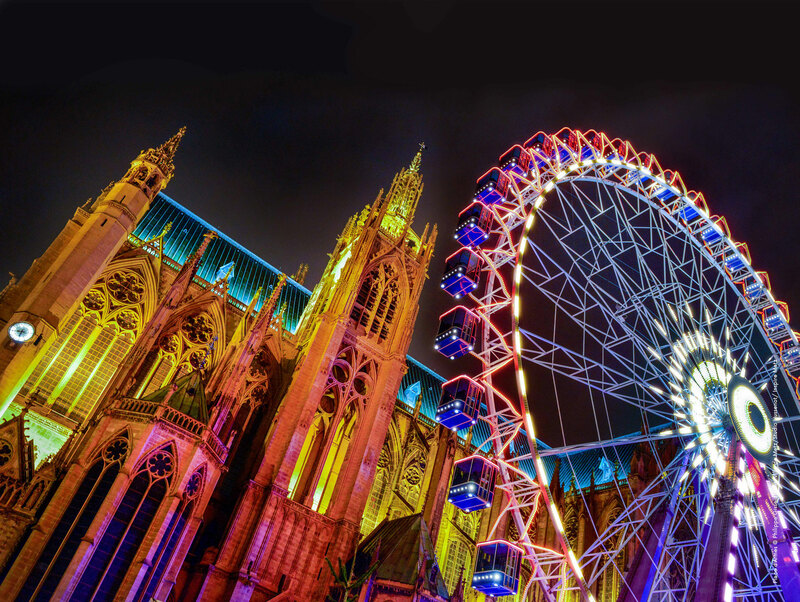 By choosing the best craftsmen, the most beautiful attractions, magnificent decorations and sublime illuminations as well as high-quality street performances, the Amiens Christmas market attracts more and more travellers from around the world every year. 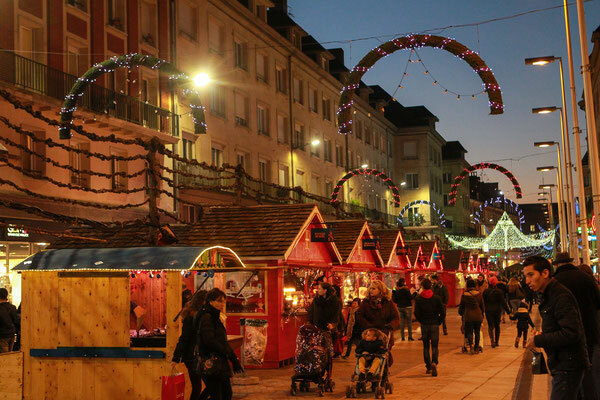 Young and old have been coming to the Amiens Christmas Market since 1997. 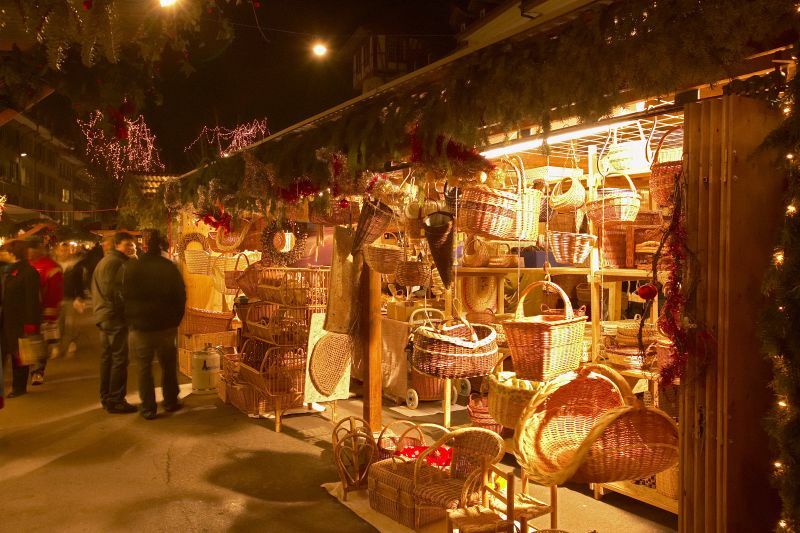 With its 130 chalets that stretch for over 2 km, it has a great choice of gift ideas. 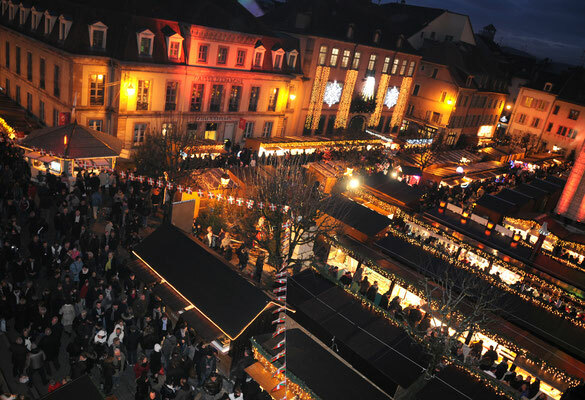 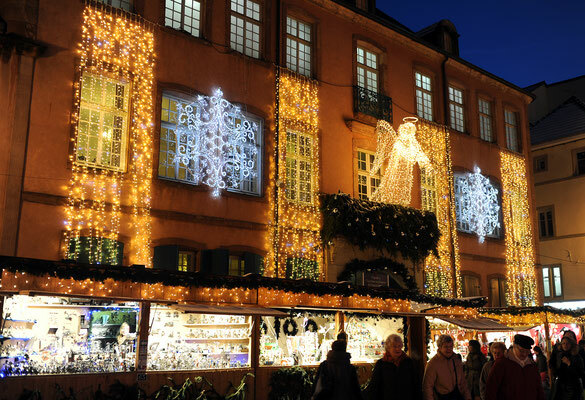 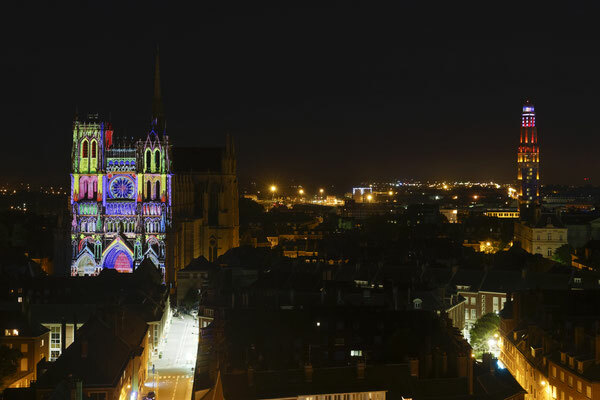 This year the biggest Christmas Market in the north of France is celebrating its 21st anniversary. 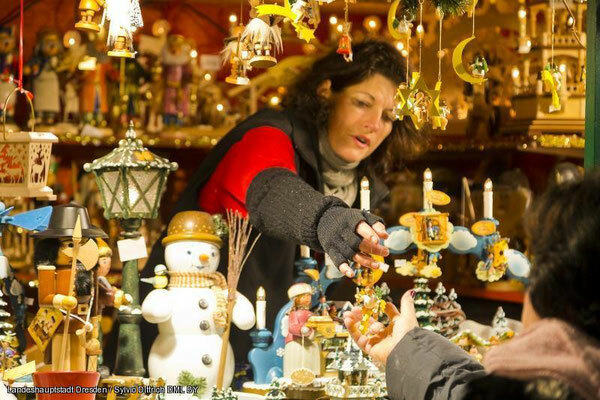 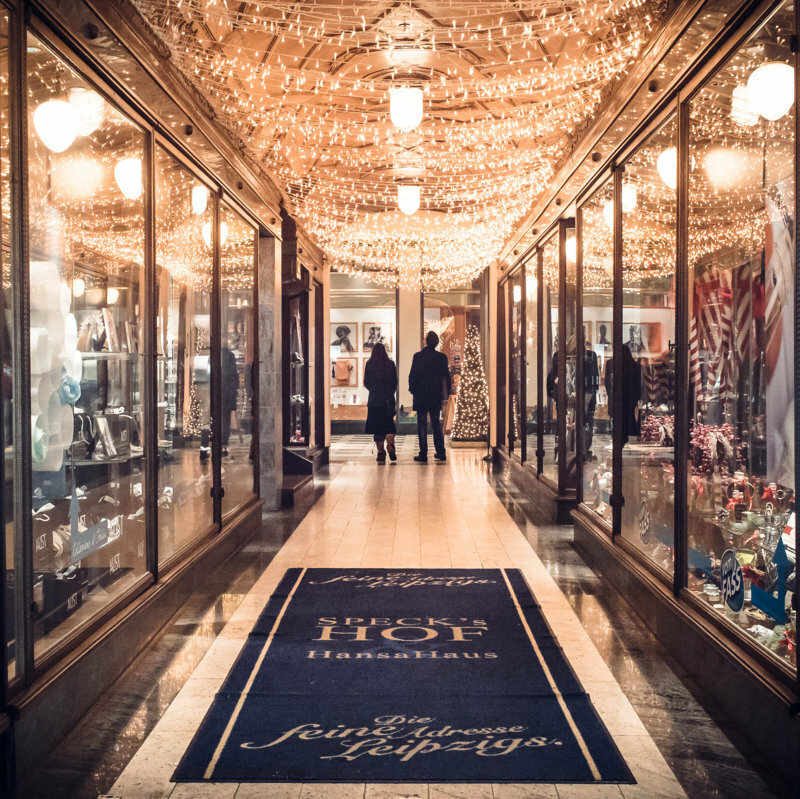 From 23rd November to 31st December, craftsmen from France and all over the world will offer a variety of handmade gifts, Christmas decorations and delicious delicacies. 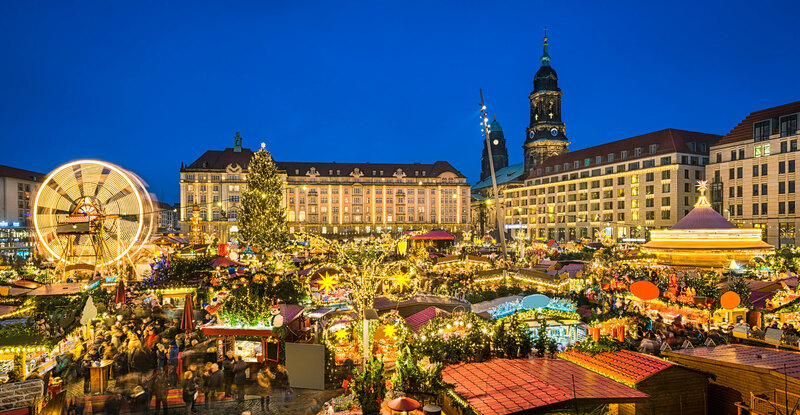 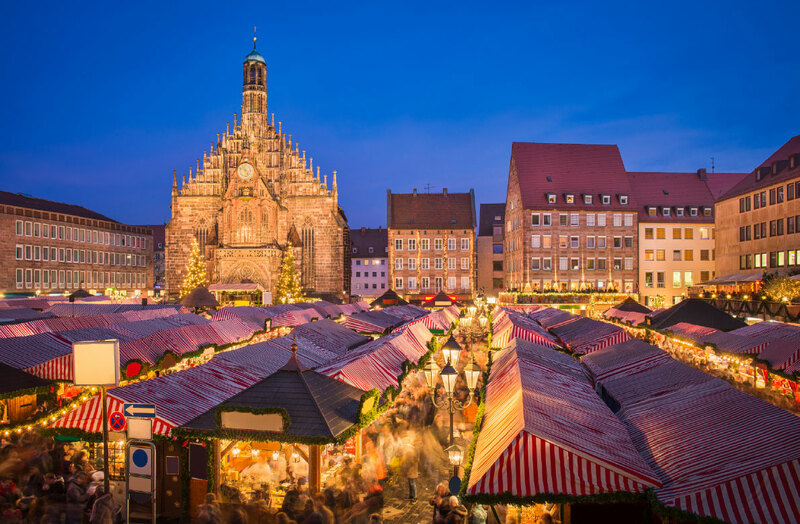 Christmas markets in the heart of the UNESCO World Heritage Site. 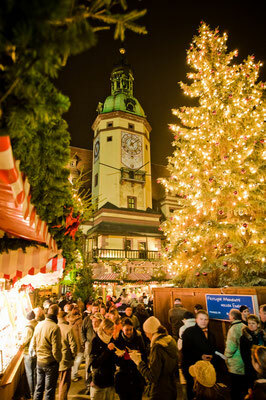 Bern's medieval streets offer a unique setting for the annual Christmas Markets.